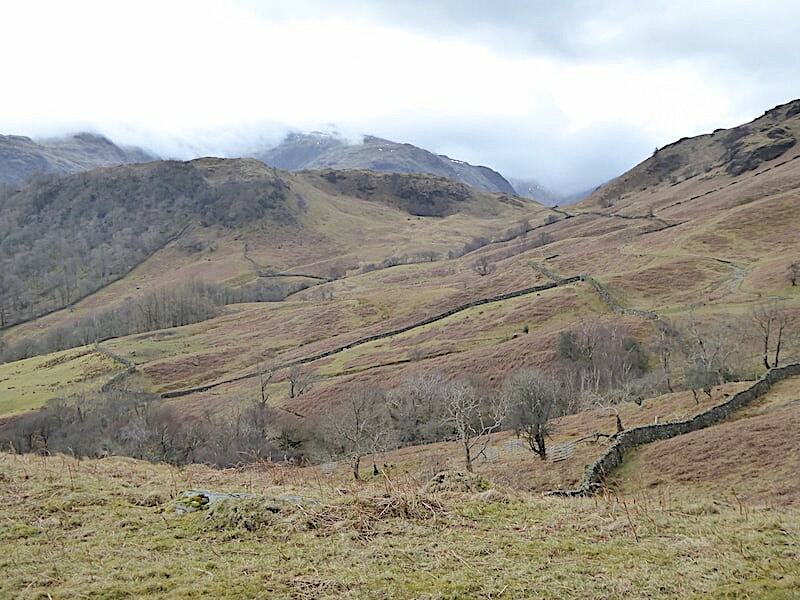 It was a nondescript sort of day today, more or less what had been forecast, with overcast skies and not much sun so, as there seemed to be little chance of the higher fells losing their cloud cover, we opted for a lower level walk in Borrowdale. You do get a little height from time to time though and, on a better day, the views can be very good, they just weren’t there today. The freezing winter conditions over the last few months has finally put paid to our walking boots, so we bought new ones last week and decided that this walk would be a good time to get them well bedded in and ready for those longer walks during the sunny summer days. Well, you can always hope they’ll be sunny, can’t you? 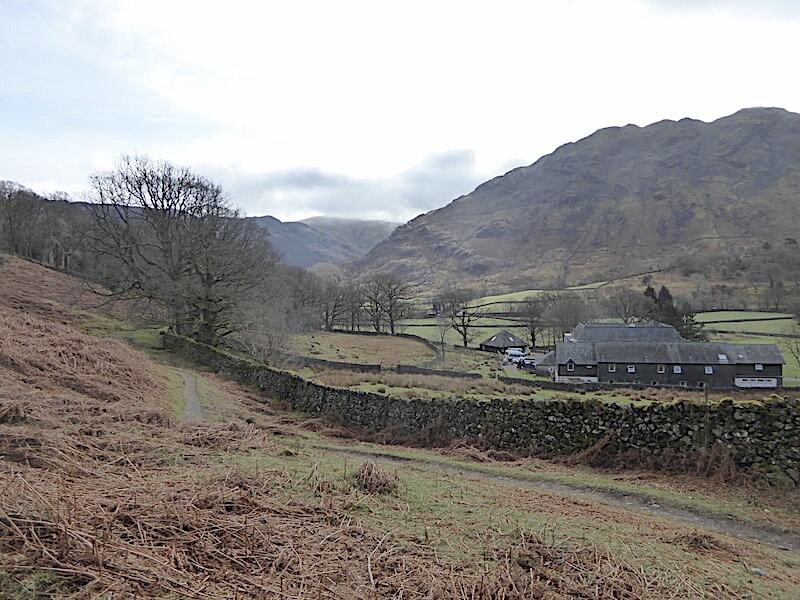 A view of Thornythwaite Fell from the car park at Seatoller during one of the brighter spells, and not much to be seen beyond it. 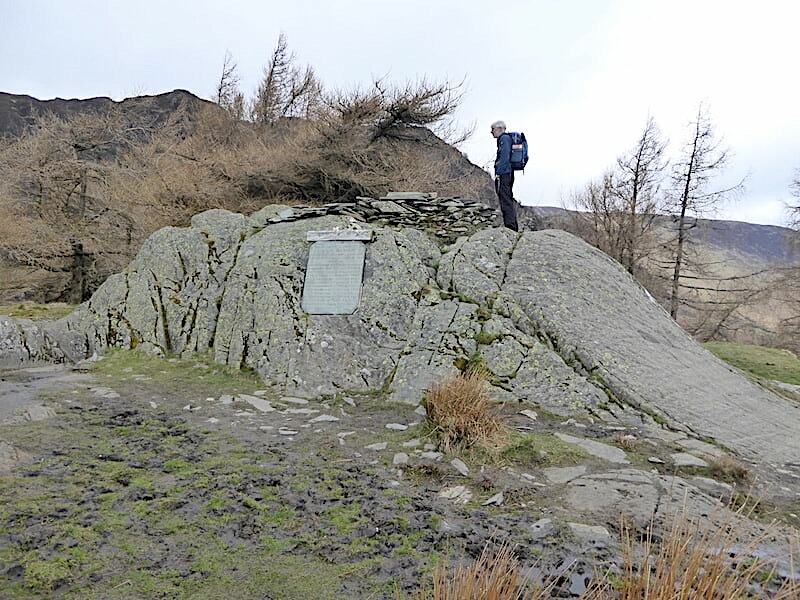 The fell is usually called Glaramara, a lovely lilting name which previously only applied to the rocky summit, but which is now generally used as the name for the whole fell. It certainly rolls off the tongue more easily than the original tongue-twister. 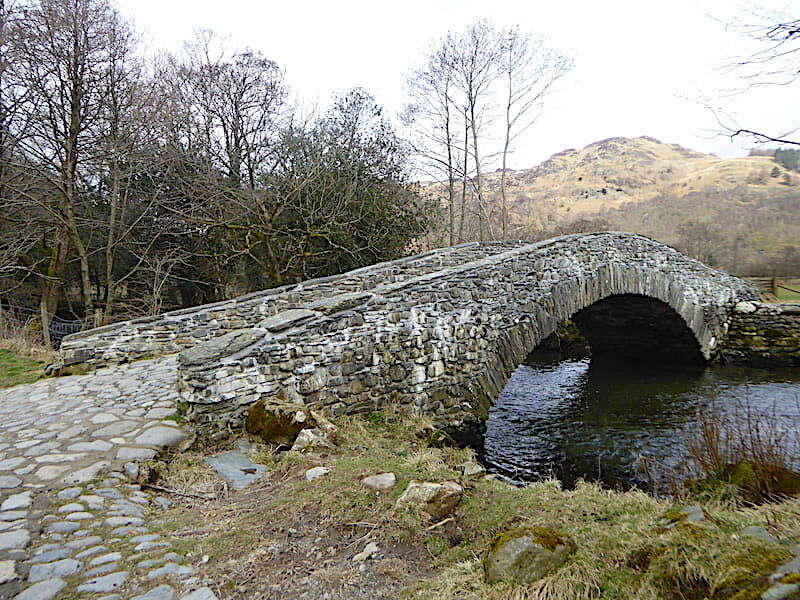 I’ll use Glaramara in this report because I like it better and its quicker to type. The walk begins at the far end of the car park with a short stroll up to the gate. The shadows on the path would have you believe that the sun was out but we were only getting the benefit of a thinner patch in the cloud cover and there was absolutely no need for factor 30 sun cream today. Beyond the gate the path splits and we follow the left hand fork. The path beside the wall in the shot is the one which goes around the base of Johnny Wood and will be our return route. 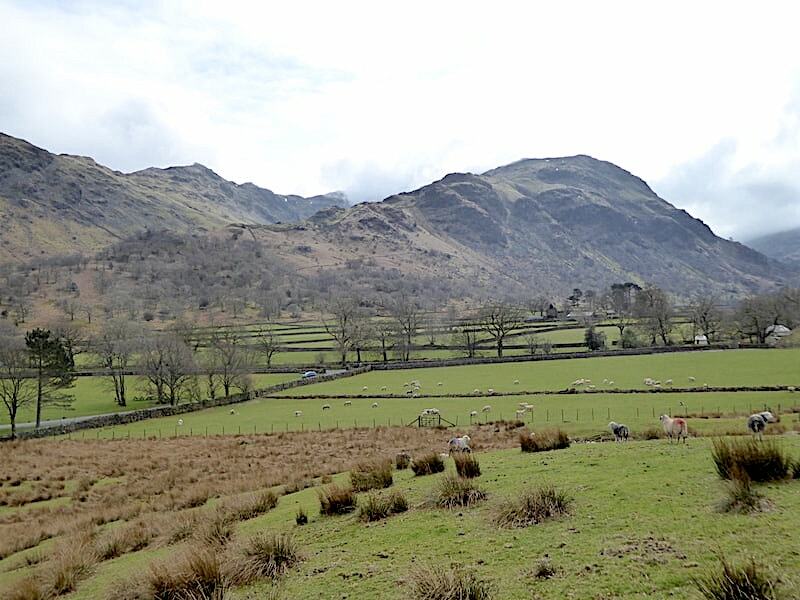 The fell on the right is Rosthwaite Fell and its highest point, Rosthwaite Cam, stands at 2008′ (612m) but AW took the subsidiary top of Bessyboot, (1804’/550m) as its summit and, as is the way of things, that is now the name which is most commonly used, although in our house it has since morphed into Bossyboots. I’ll use Bessyboot during the rest of the report as again its quicker to type. 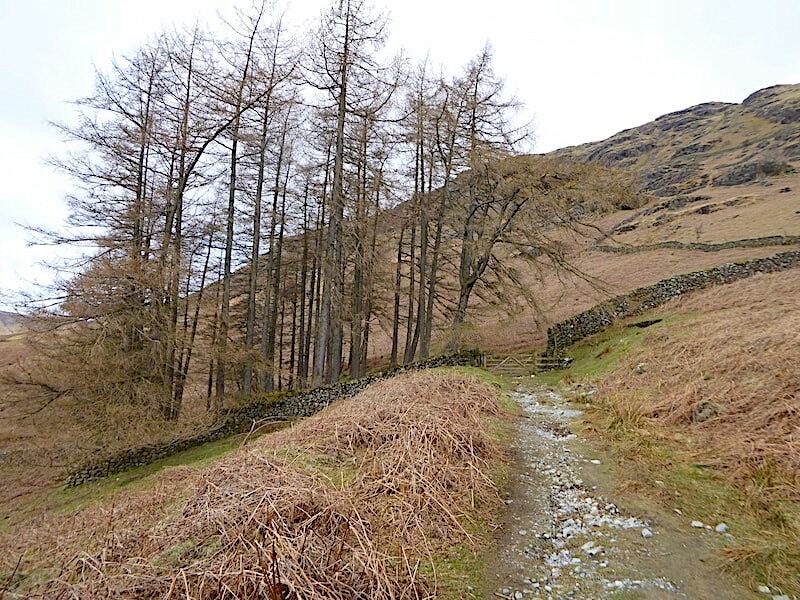 We carry on the left hand path until reaching this stream where we turn sharp left uphill towards …..
….. this stand of four Scots Pines although from here it looks as though there are only three. This is the only very steep section of the walk but its quite short so its soon over and done with. The jackets just had to come off by the time we reached the top. 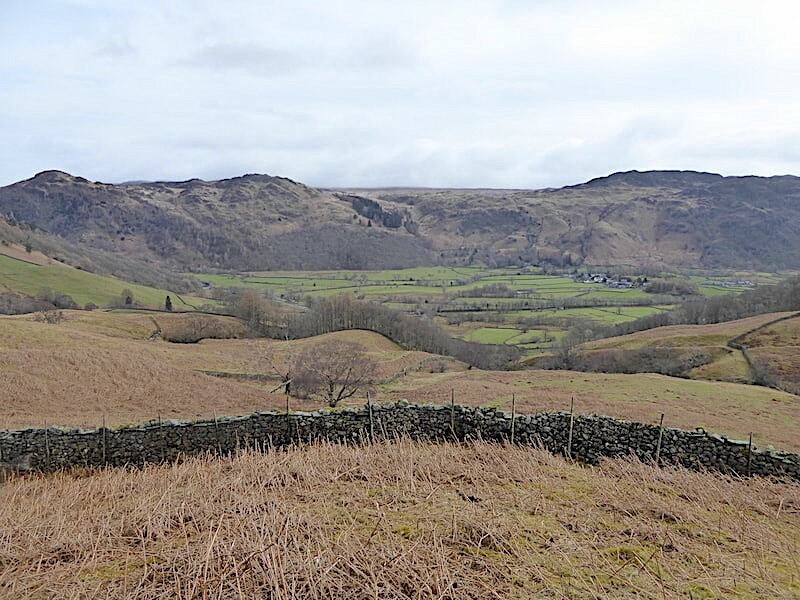 Dead bracken everywhere, which is becoming a bit dreary to look at after seeing nothing else for the last six months, but then its a whole lot better than seeing it green and shoulder high and fighting your way through it. There’s just no pleasing some folk when it comes to bracken is there? 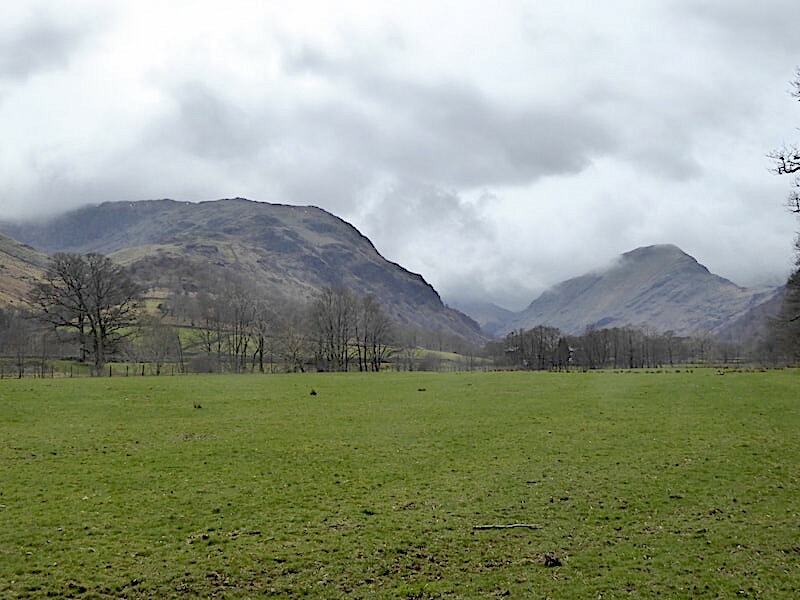 A look over to our left at the cloudy view of some of the fells along Borrowdale as we climb the slope. Seatoller Fell isn’t lofty enough to be plagued by cloud but behind it, to the left, Base Brown has some drifting across it, and over on the right the same thing is happening on Grey Knotts. 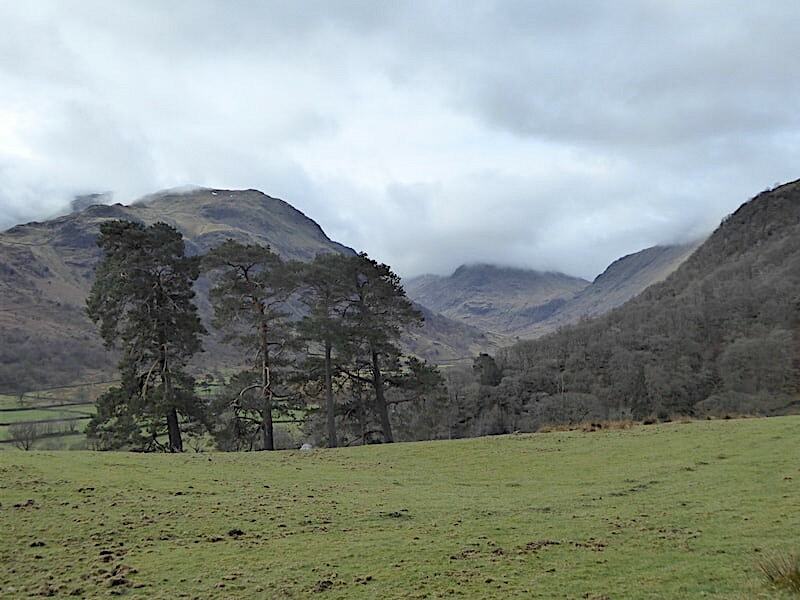 A look across at the four Scots Pines and the murky view along Borrowdale. 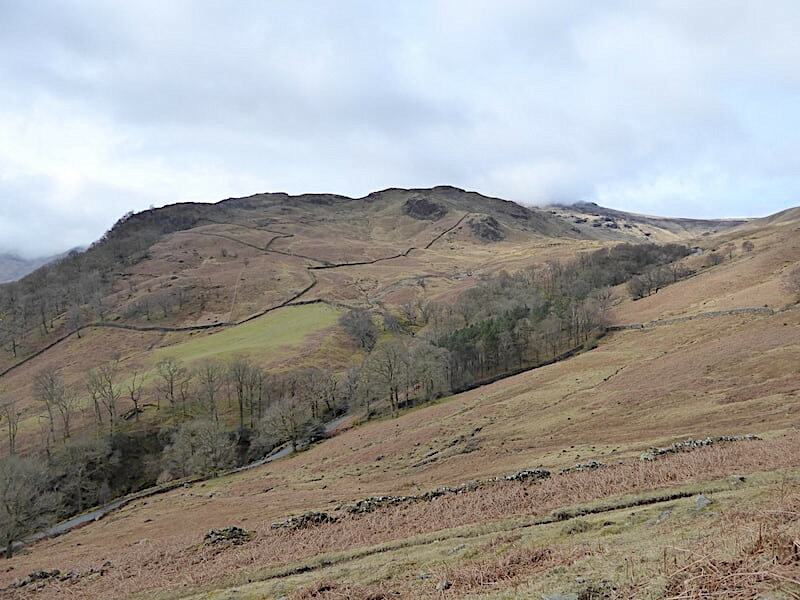 A better view of Seatoller Fell as we walk the wide track which contours around the slopes of High Doat. 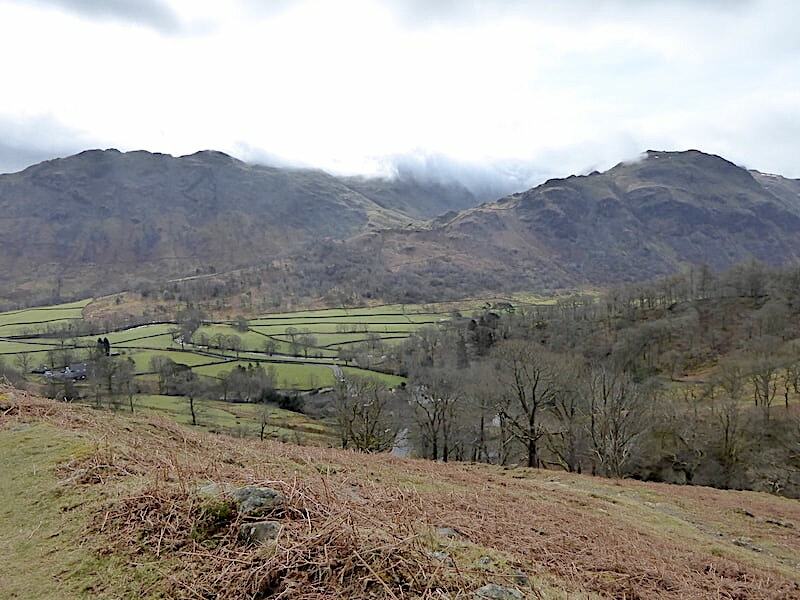 We still have decent enough views of Bessyboot and Glaramara as we take a look behind us, but Rosthwaite Cam and Combe Head, which should be visible between the two, are lost in the cloud layers. 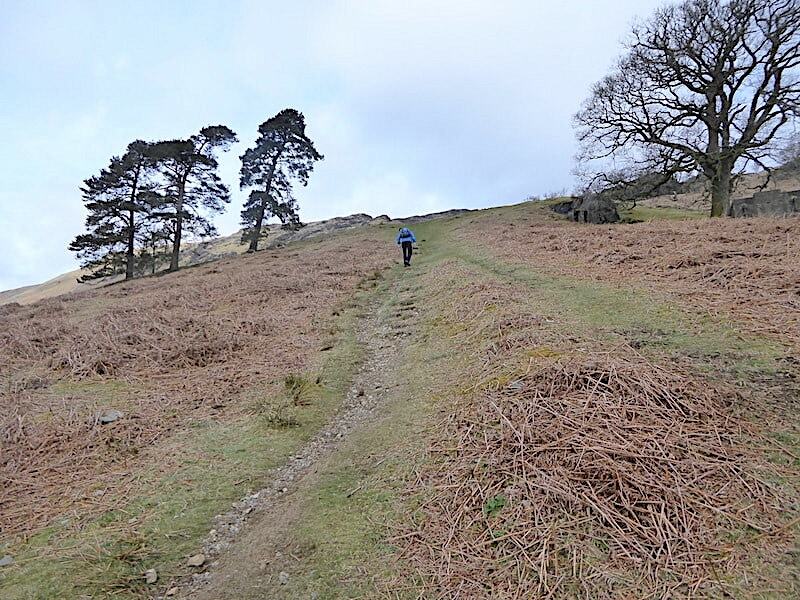 Instead of veering off over High Doat we keep to the track, pass through the gate and continue on just a short distance to the point where …..
….. we meet up with the old mine track coming down from the Honister Pass and double back along it towards Castle Crag. 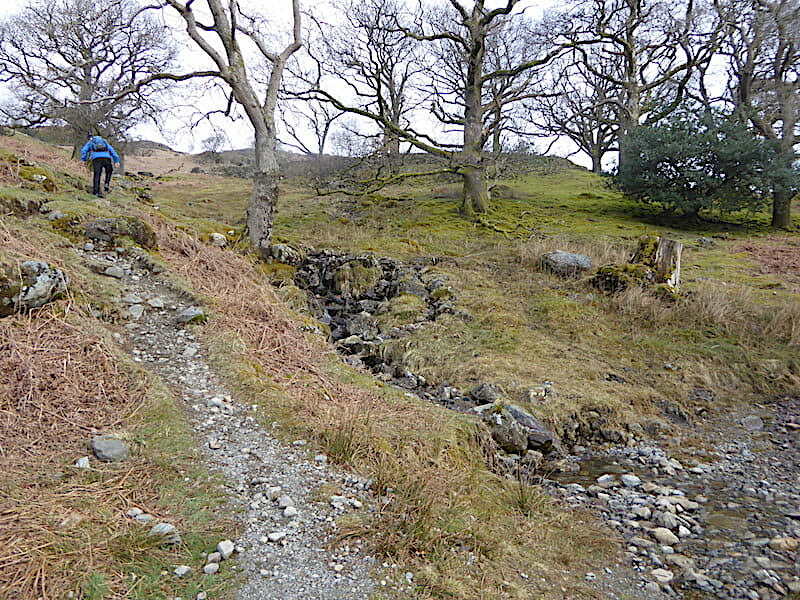 This track used to be part of a long distance path (LDP) known as the Allerdale Ramble, devised in 1976, beginning in Seathwaite and going on to Cockermouth, with a variety of route options along the way. 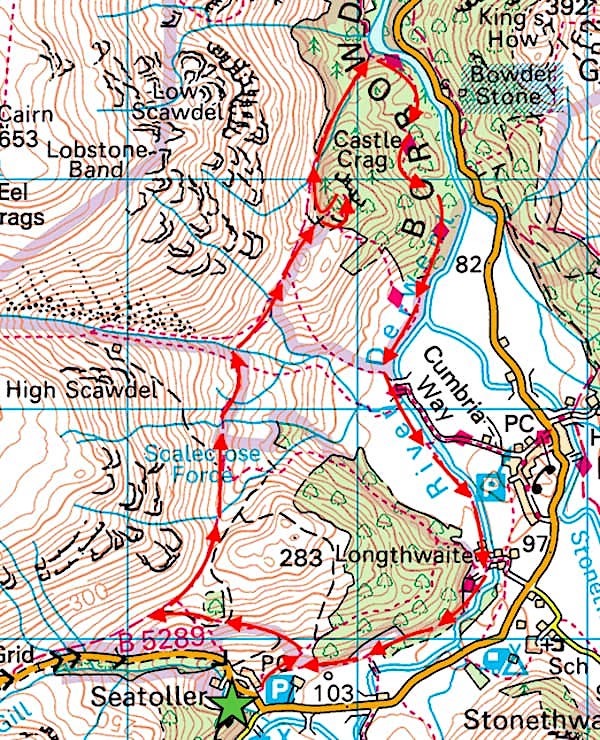 However in 2010 Cumbria County Council decided that it would no longer support the route so now it is no longer waymarked or recognised by Ordnance Survey as an LDP and is not marked as such on the appropriate maps. 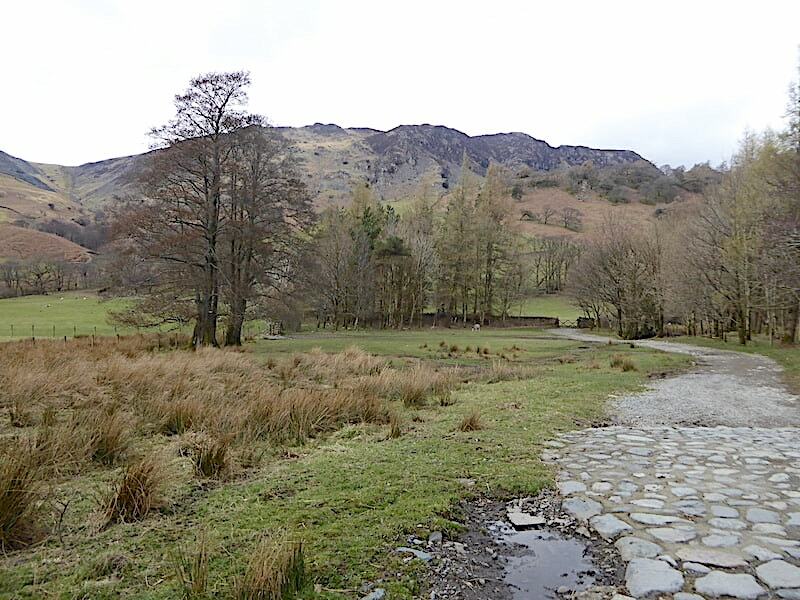 It may not be marked as such on the OS maps but here’s the Borrowdale section of it, still on the ground, still being walked and still being enjoyed by everyone who walks it. 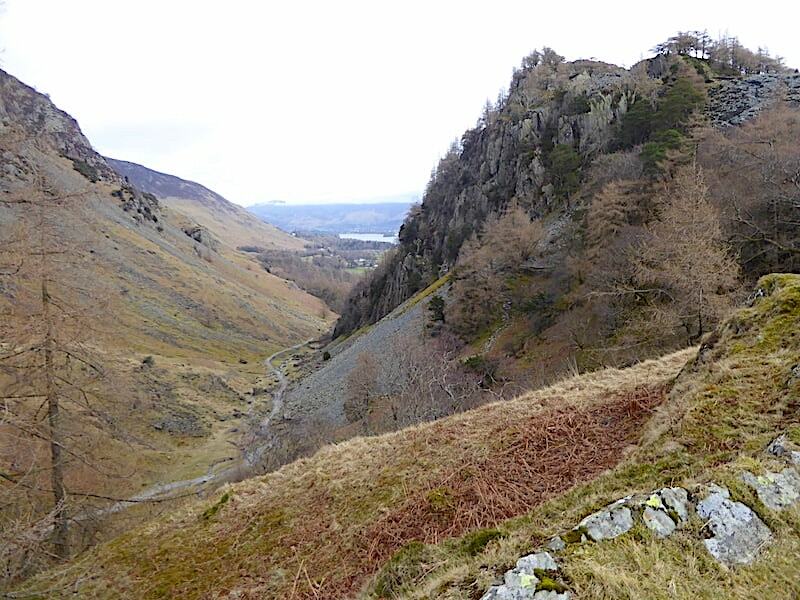 Castle Crag, the diminutive fell in the centre, and Grange Fell to the right of it remain in view until the track begins to descend down Broadslack Gill. 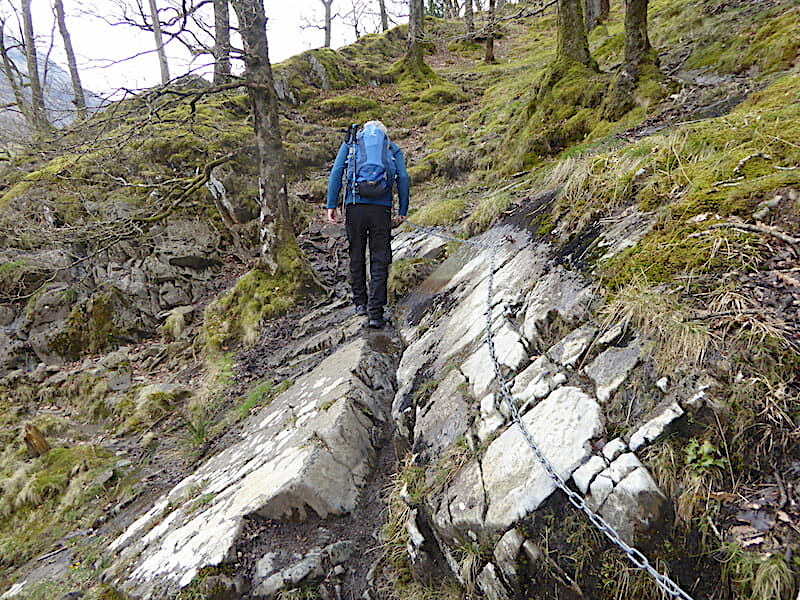 High Scawdel towers over us as we approach the footbridge over Scaleclose Gill …..
….. and beyond High Scawdel and the bridge is Low Scawdel. The High and Low prefixes relate to their geographical positions in the valley not to their individual heights, the high points of both being marked as 1709′ (521m). 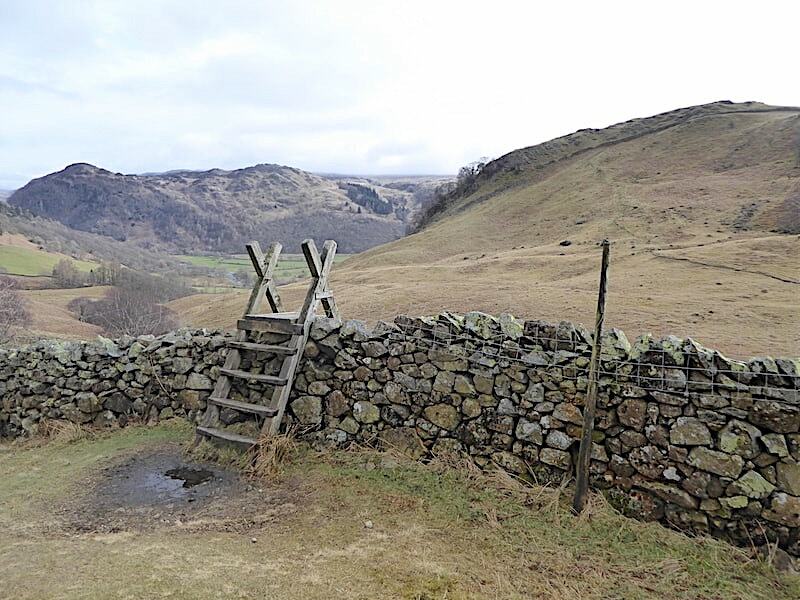 The ladder stile gives access to the path down Scaleclose Gill, with its view of Scaleclose Force and, should it be required, an opportunity to shorten the walk and return to Rosthwaite. 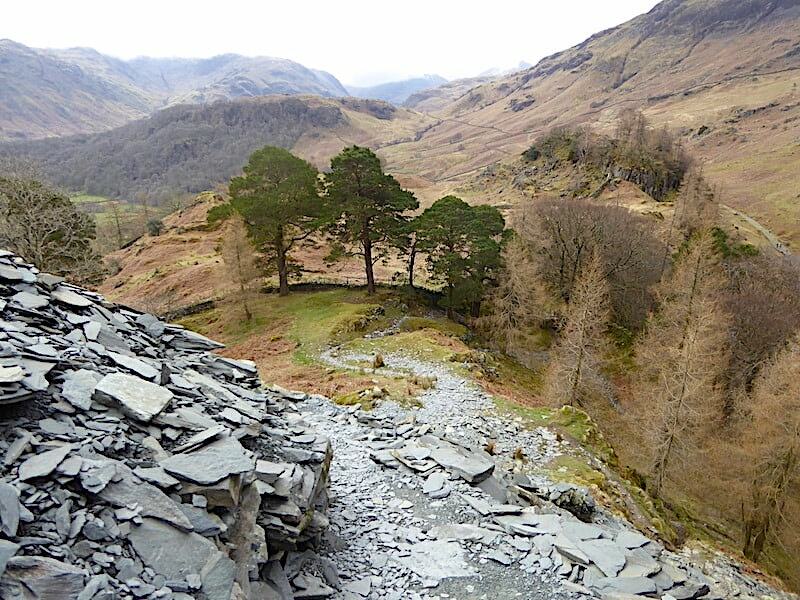 The view from the Scaleclose Gill bridge up to High Scawdel. 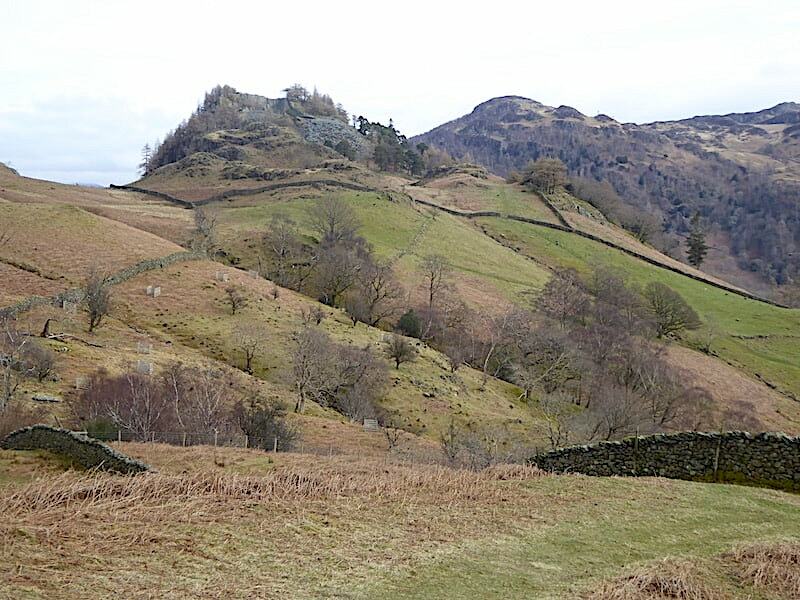 Further along the path and the view across Borrowdale to Grange Fell on the left and Great Crag, on the right, with the little hamlet of Rosthwaite below it. 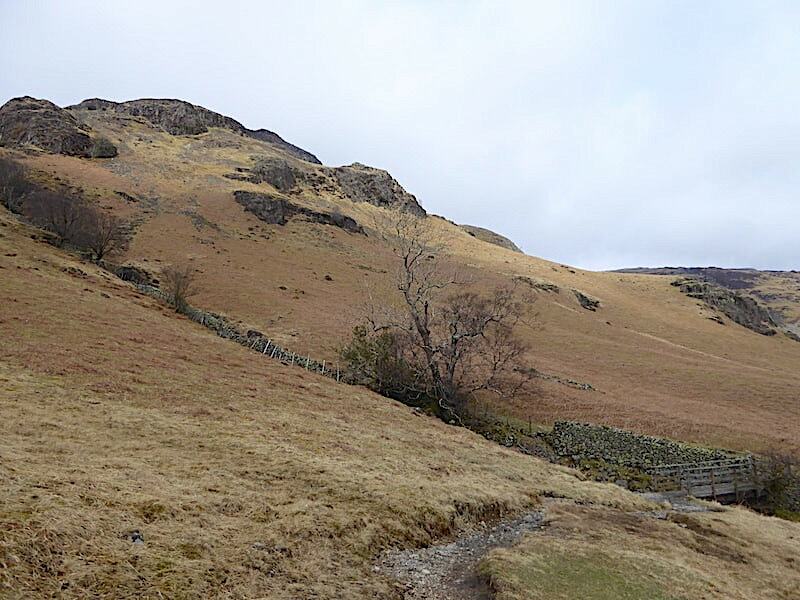 A close up of Castle Crag and its neighbour, King’s How, one of the subsidiary tops on Grange Fell. 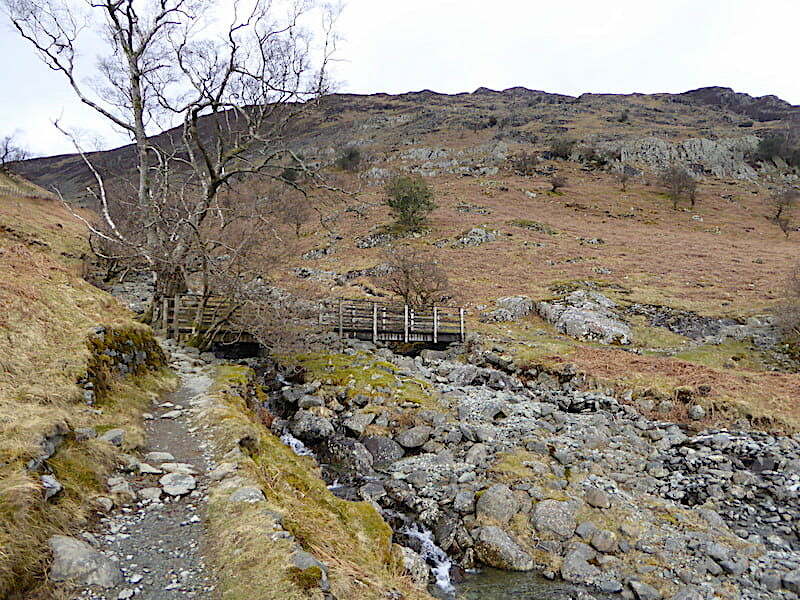 Another footbridge to cross, this time over Tongue Gill. Beyond the bridge we could have continued up alongside Tongue Gill to the Rigghead Quarries but we didn’t bother today. 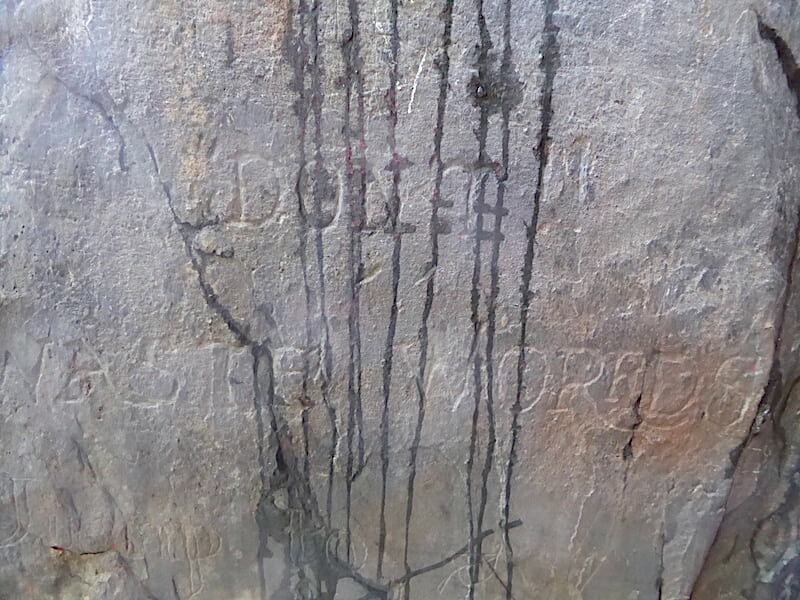 We have been up to the quarries before so if you want to see what’s there just take a look at our walk on 17th Dec 2016. 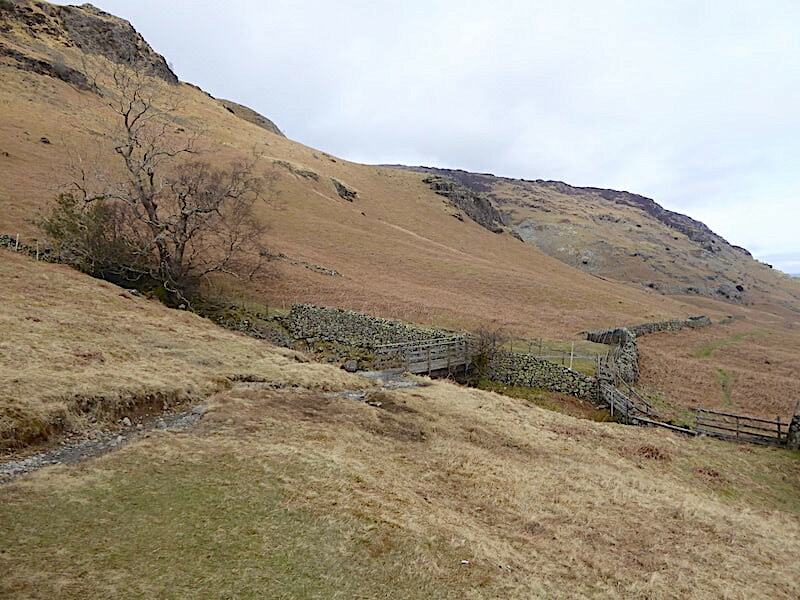 You could also keep on walking up beside the gill and eventually emerge at the little col just below High Spy if you had the time and the inclination. 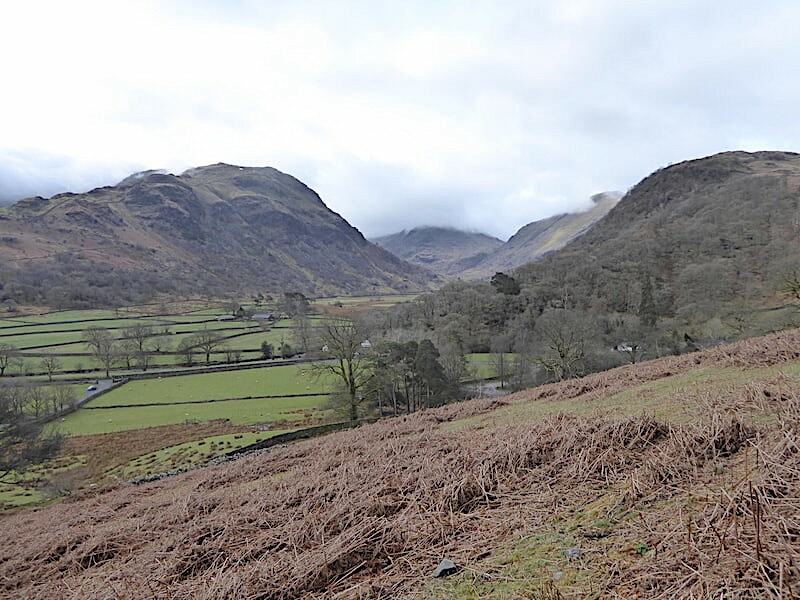 Things haven’t improved to any great extent along Borrowdale although from Lingy Bank, where we are standing, we can see a bit more of Eagle Crag, towards the end of the valley on the right, than we could earlier. 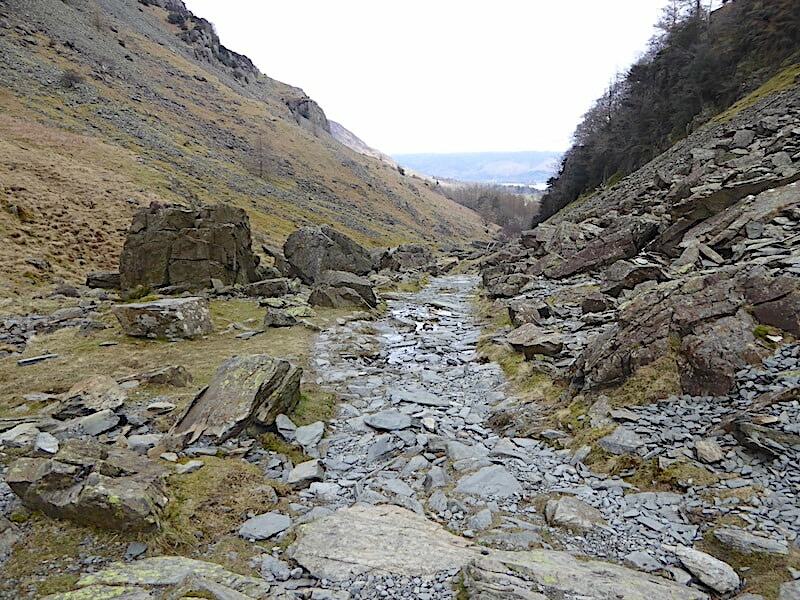 A little way beyond Lavery Gill and a look back towards Tongue Gill and High Scawdel. If you peer very closely at the top right hand corner of the shot you may be able to see the grey spoil heaps of the Rigghead Quarries. From the same spot, but looking a little further down the slopes, you may be able to pick out the line of the path we have been following. It more or less follows the line of the wall traversing the slopes although keeps to a line rather higher than the wall itself. 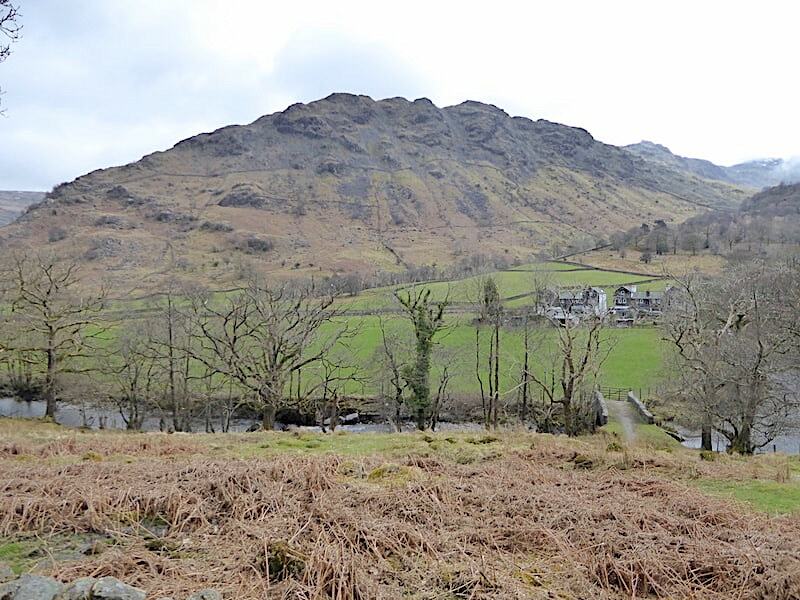 Over on the left is High Doat, and behind it, in the centre, is Seathwaite Fell, still with cloud drifting around its summit area. 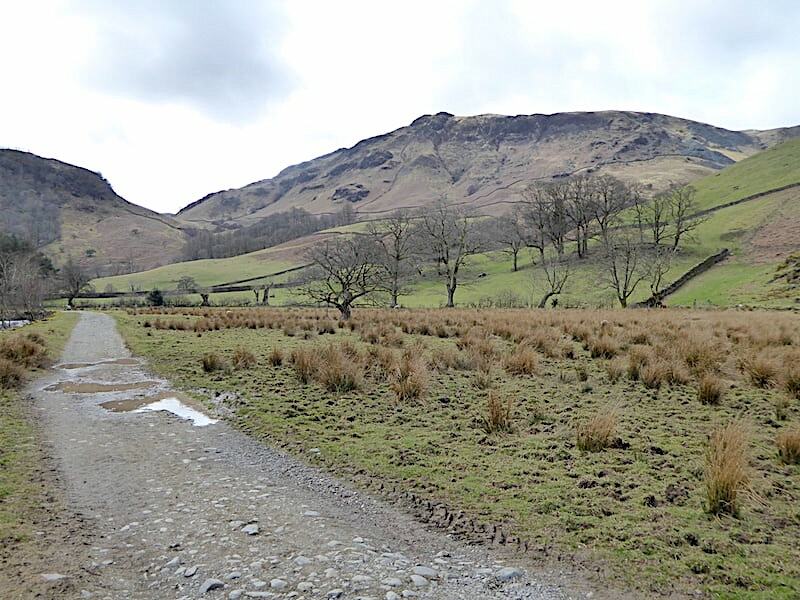 Looking ahead to Castle Crag. Shall we bother going up today? Oh, go on then. 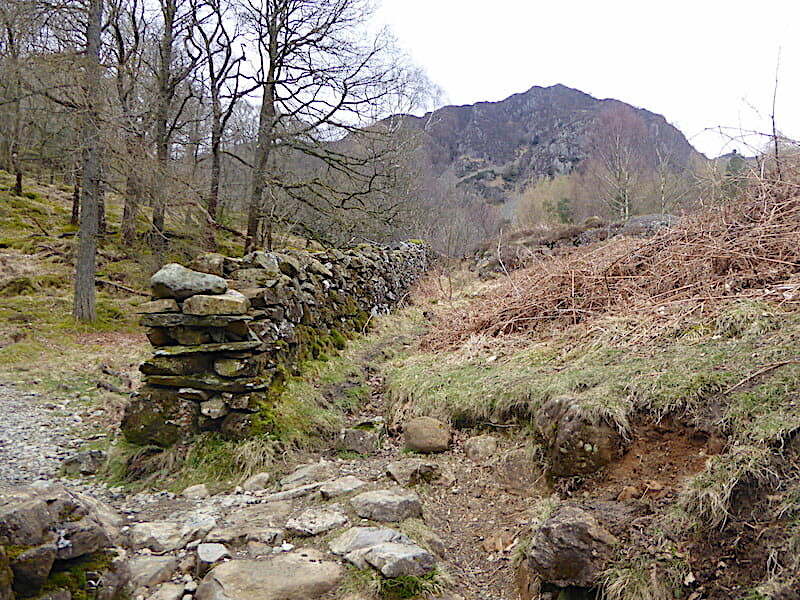 So we leave the Allerdale Ramble path and take the narrow track going over to the right of the shot. 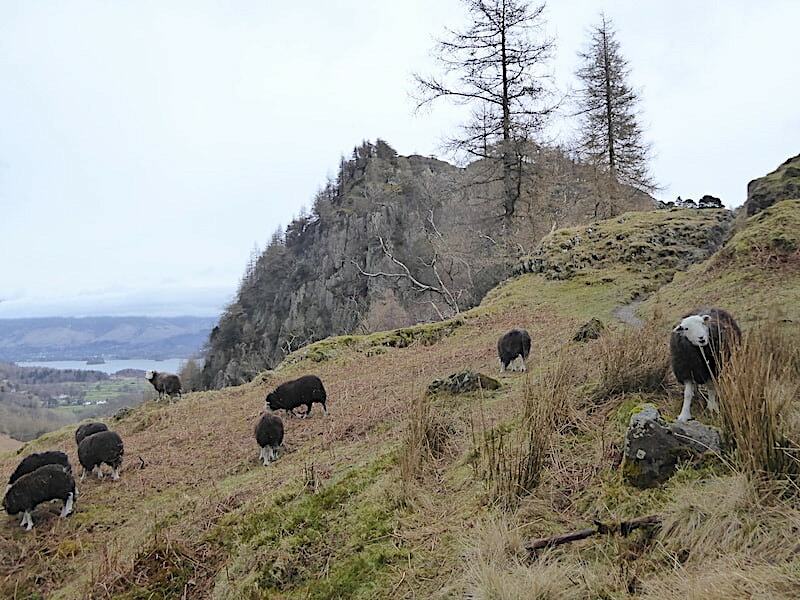 We meet a group of Herdies as we climb to the top of the track, most of whom completely ignore us apart from this one, who stared at us very inquisitively until we disappeared over the brow up ahead. 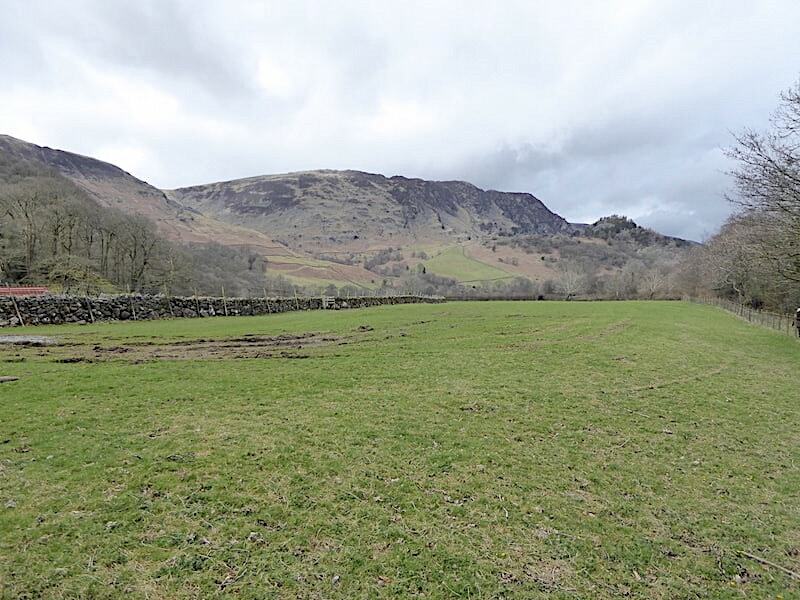 Castle Crag is the lowest of AW’s 214 fells at 950′ (290m) and he gave it the status of a separate fell because – ‘it is so magnificently independent, so ruggedly individual, and so aggressively unashamed of its lack of inches’. 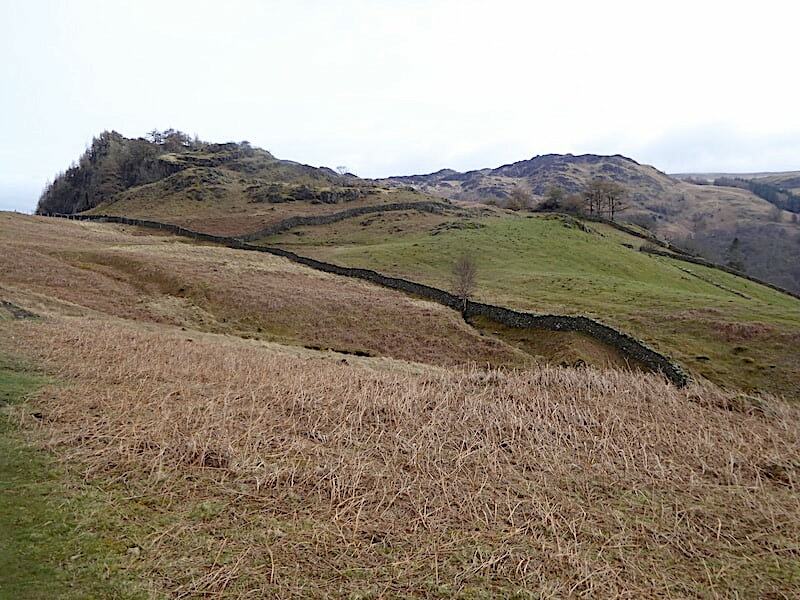 It may only be the smallest of his named fells but from the top of the narrow track its a heck of a long way down to the Allerdale Ramble path. 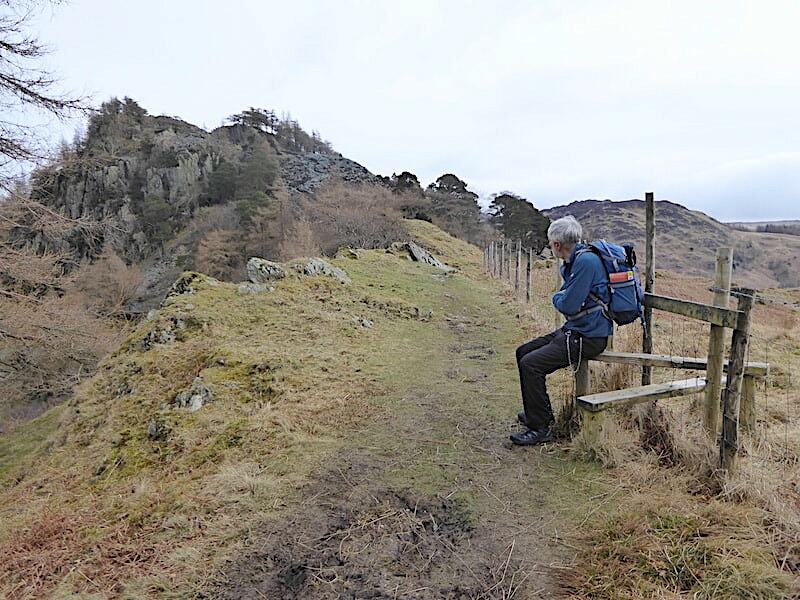 J takes advantage of the stile for a couple of minutes while he waits for the photographer to join him. 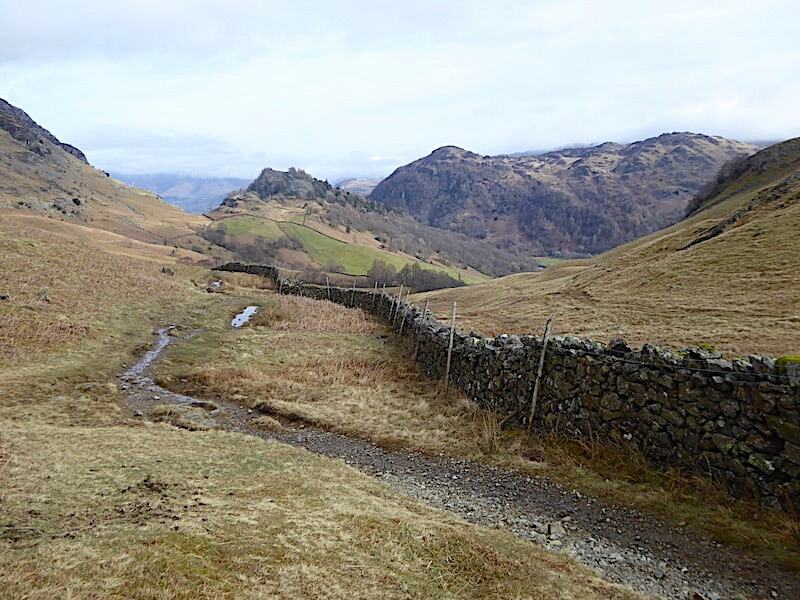 We continue along the path to a ladder stile in a fence at the base of the crag …..
….. with another look down along Broadslack Gill, with the merest hint of Derwentwater beyond, as we do so. 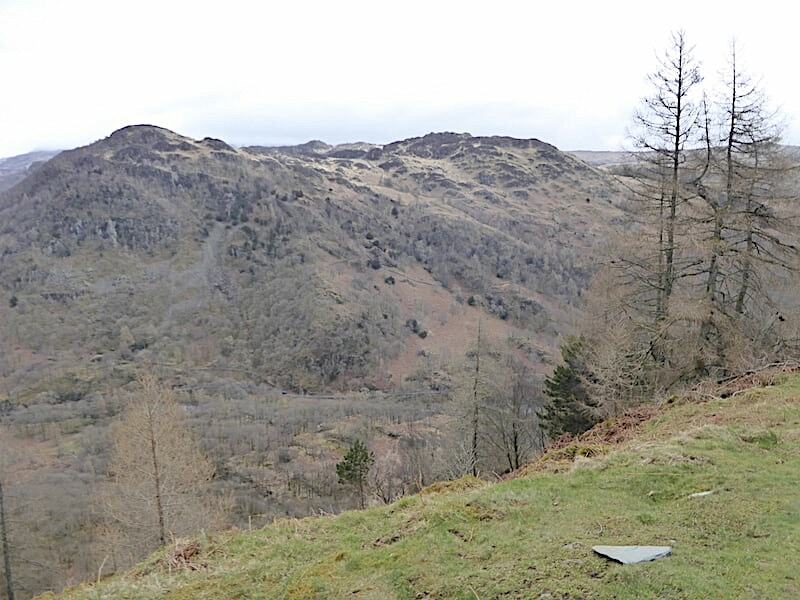 Below us is the ladder stile in the fence by the trees from where we climb the tinkly slate slope …..
….. up to the flattish area below the ziz-zag path up the spoil heap. We took a coffee break here to give the family already climbing up the chance to get to the top without us snapping at their heels. Not that we ever snap at anyone’s heels but I think you’ll know what I mean. 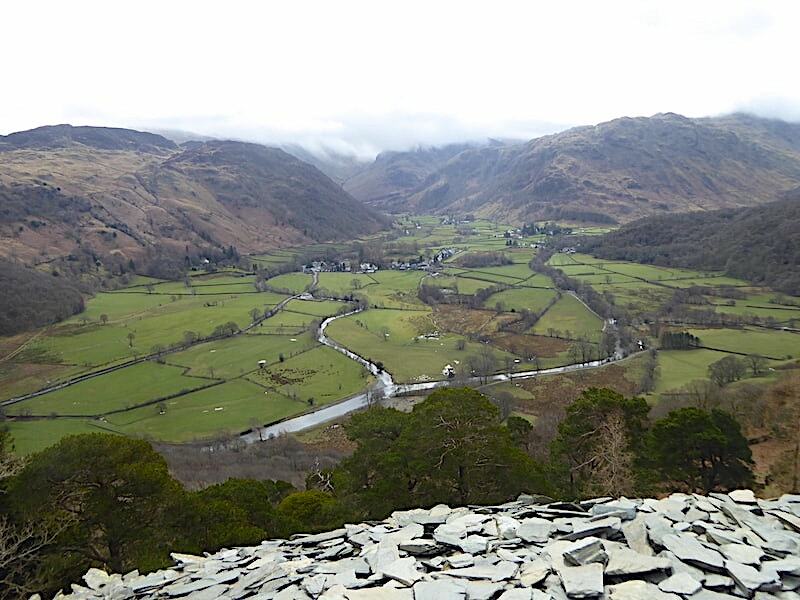 There are plenty of improvised slate seating arrangements on this flattish section …..
….. and why not, when the view is this good, even on a claggy day. On a good day it would be even better, a grand spot for a Mars Bar and coffee break. Another look back along the route so far from our coffee break viewpoint. Coffee break over we make our own little trek over the tinkling slate of the zig-zag path and head towards the summit, with a look down into the quarry on the way. 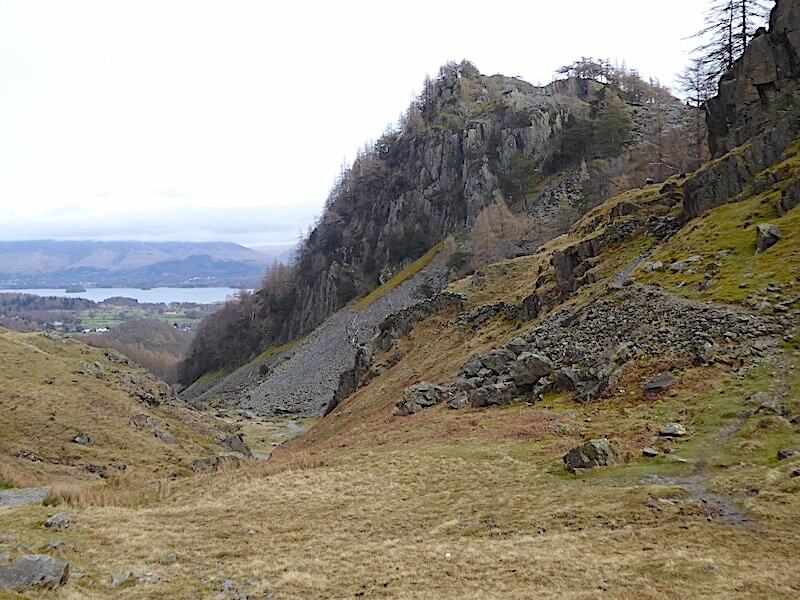 Castle Crag summit can just be seen in the top right corner behind the clump of orange-brown grass on the top of the quarry rock face. 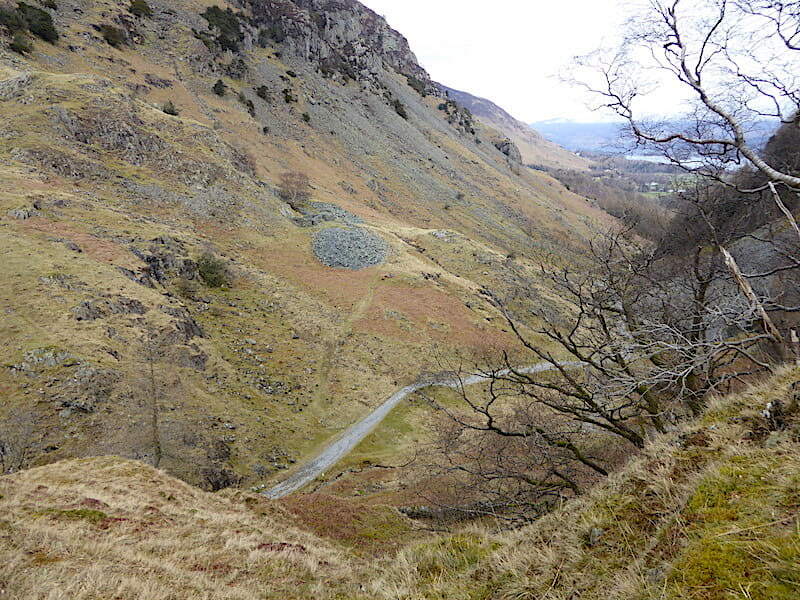 Good thing they stopped quarrying or AW might not have been able to include this little hill. Not a view of Cape Town’s Table Mountain, just the cloud covered Skiddaw fells bringing the view along the River Derwent down to Derwentwater to an odd looking full stop, almost as if the fell tops have been sliced off with a carving knife. 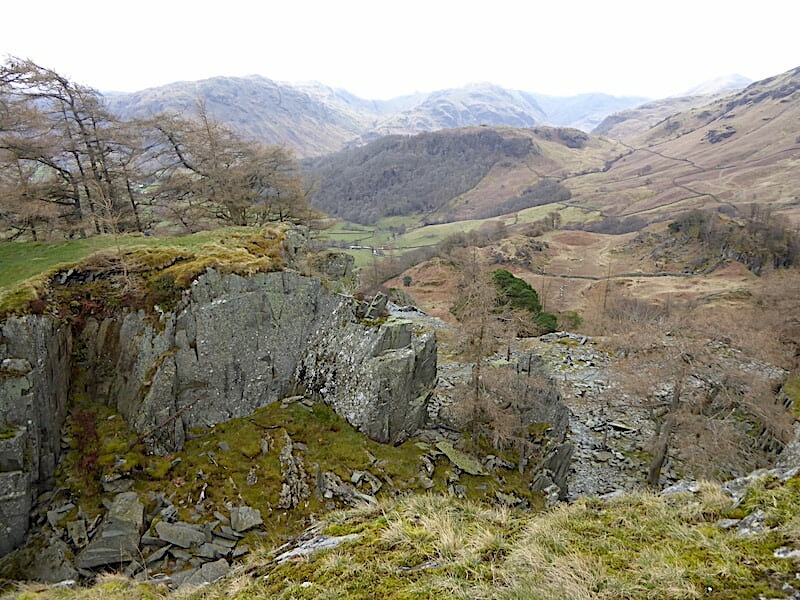 The river and the road have to squeeze through the narrow gap between Castle Crag and its neighbour Grange Fell on the opposite side. 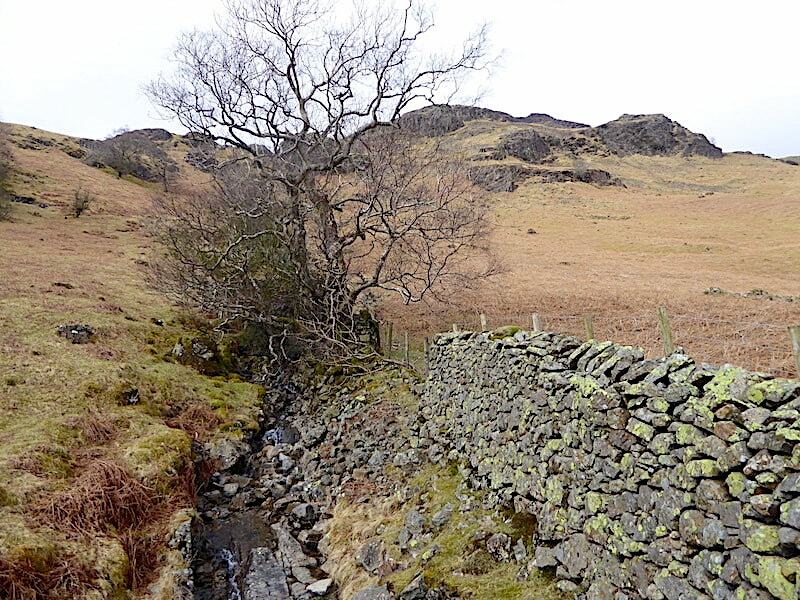 This narrow gorge between the two fells is known as the ‘Jaws of Borrowdale’. 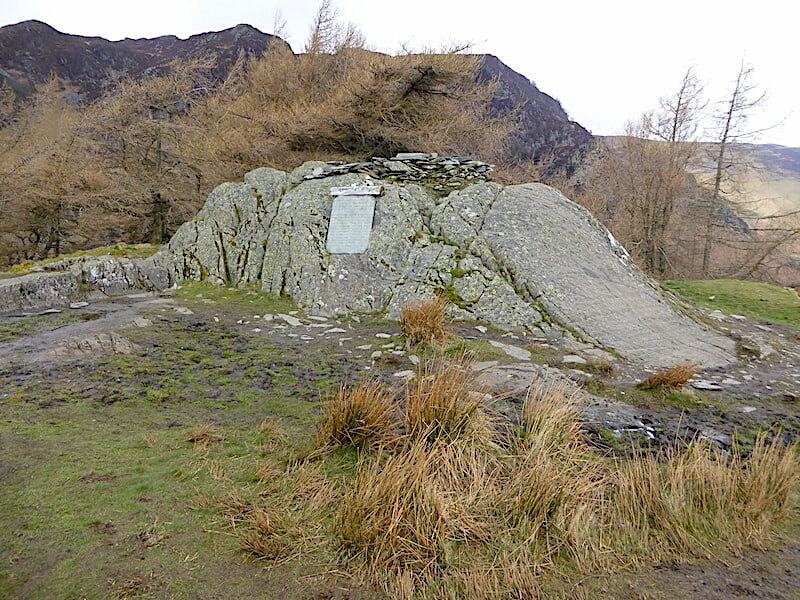 The rock plinth forming the summit of Castle Crag …..
….. and the WWl memorial plaque attached to it. 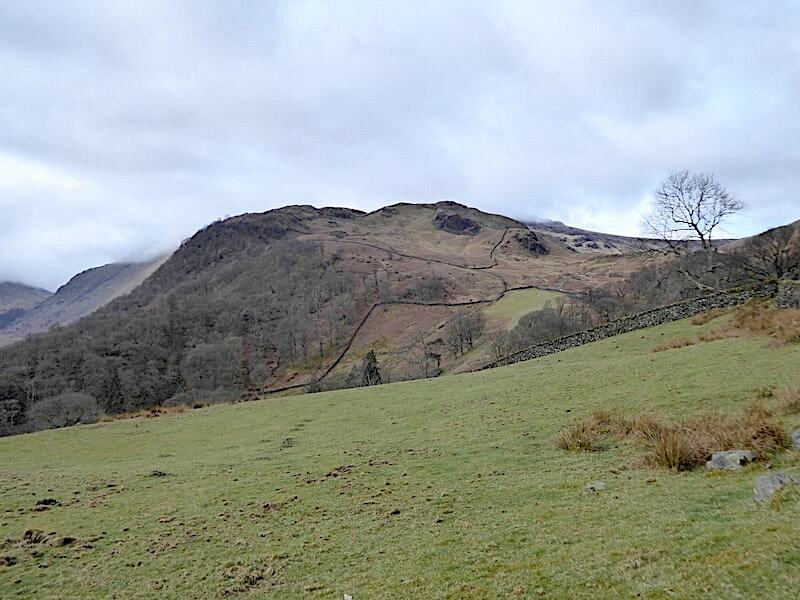 Across the narrow gorge below us is Grange Fell with its two subsidiary summits of King’s How, on the left, and Brund Fell, towards the right of centre. A moment or two of contemplation on the summit. 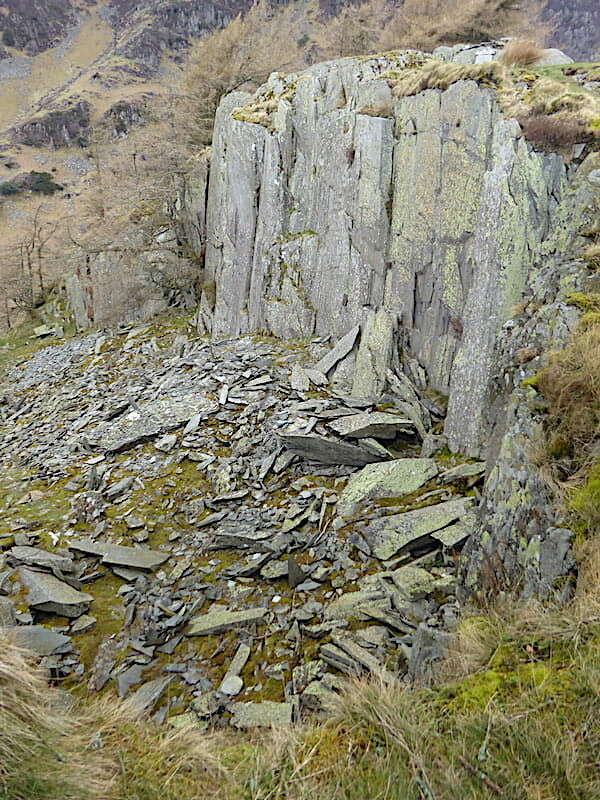 Another view looking down into the quarry. 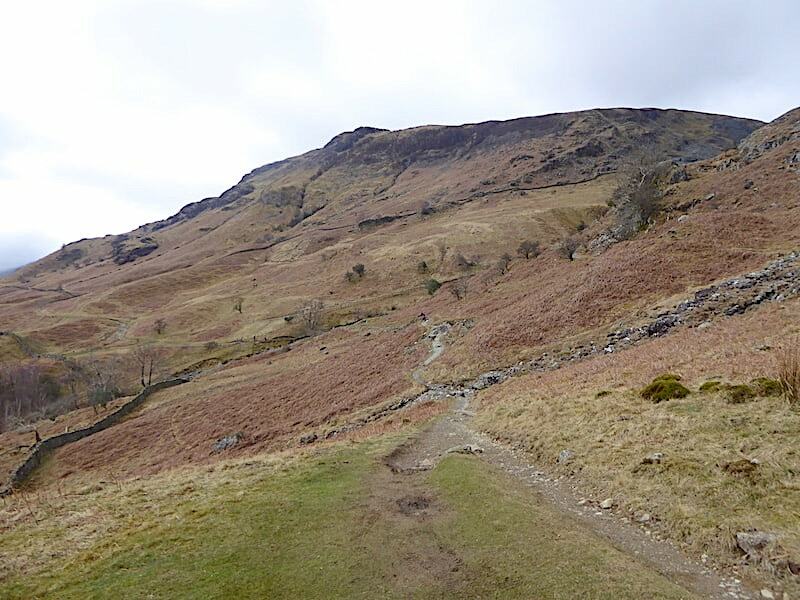 Safely down from Castle Crag and we continue along the rocky route down Broadslack Gill …..
….. and a look back up it. 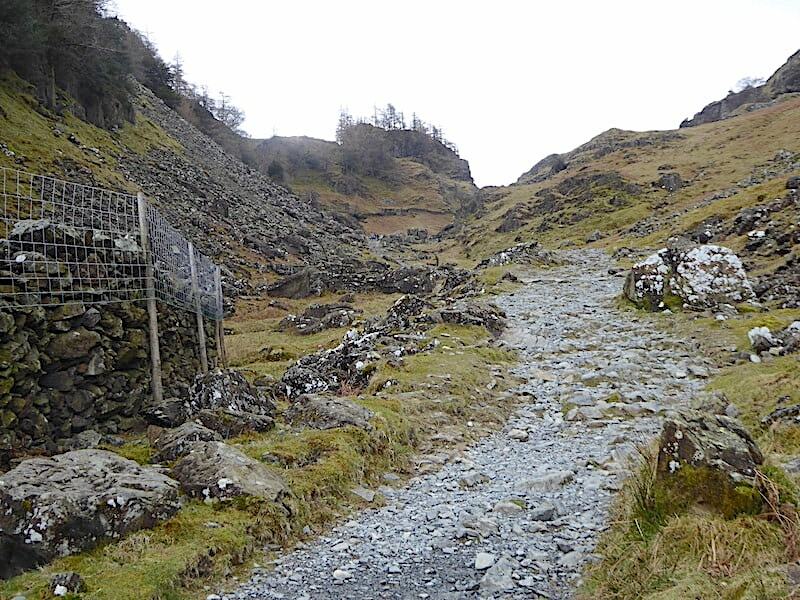 There’s no-one visible in the shot but there were plenty of walkers using this path today. 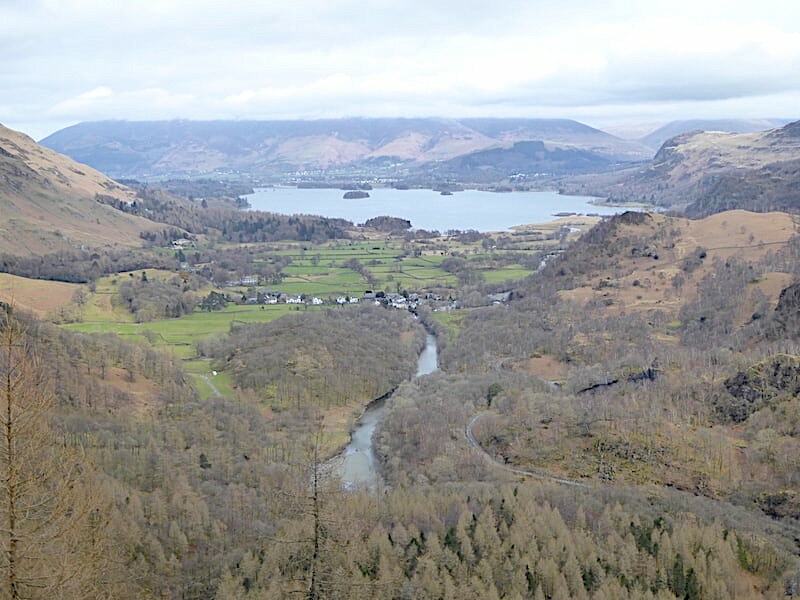 Almost back down at valley level …..
….. where we spend a few minutes at the riverside generally doing not very much other than watching the river flowing quietly along to Derwentwater and lots of walkers coming and going. 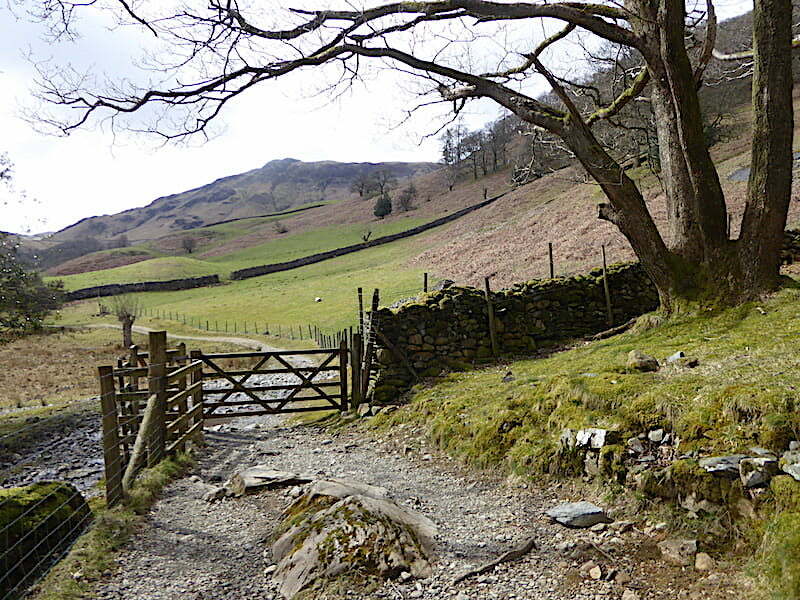 The path splits at this point and continuing along it to the left of the river from this point will lead you down to the village of Grange, while behind me the path turns sharp right and heads back towards Rosthwaite and Seatoller. 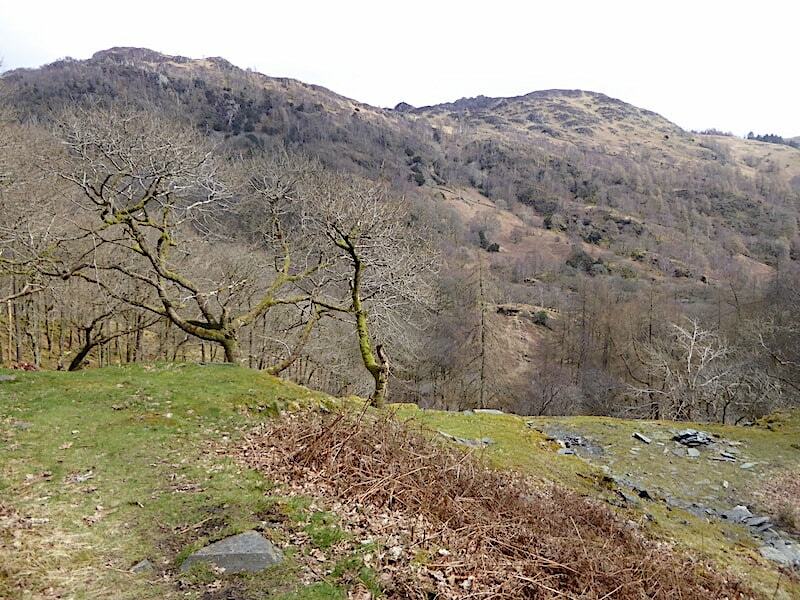 We take the right hand turn and continue along the pleasant and undulating path through Low Hows Wood. 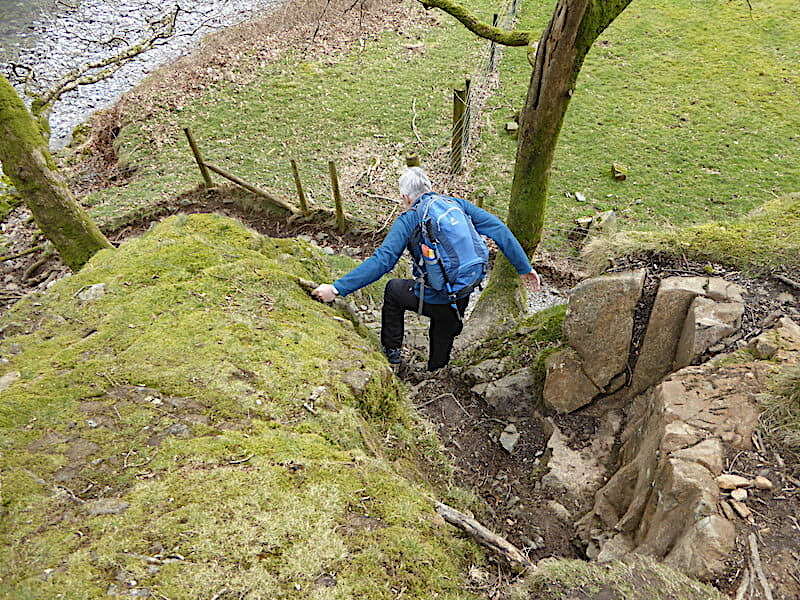 A short climb away from the river takes us up to this break in the wall with its view of Goat Crag on Low Scawdel. We carry on through the gap in the wall and follow the path to a junction with a double finger signpost. 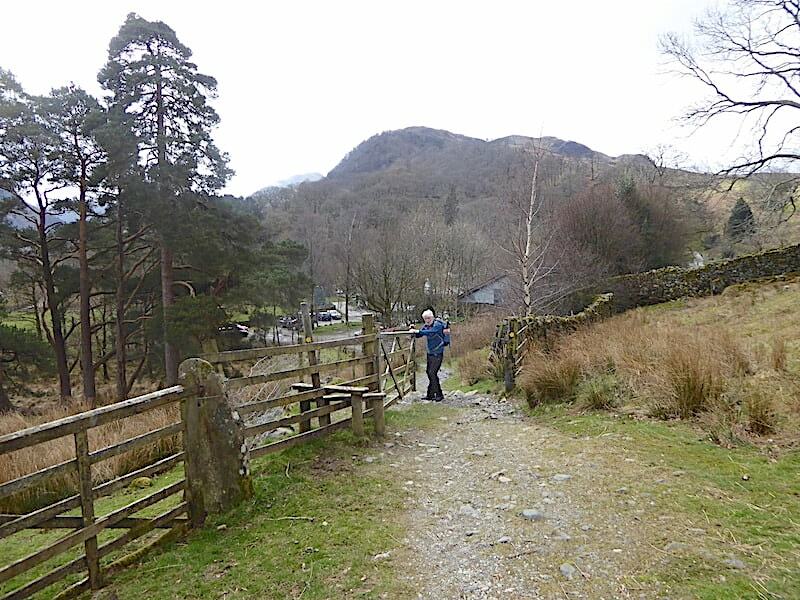 One of the fingers indicates the direction for Grange, back the way we have just come, the other finger indicates the direction for Rosthwaite, the way we are heading. There is also another path, leading off to the right at this junction, for which there is no destination indicator. 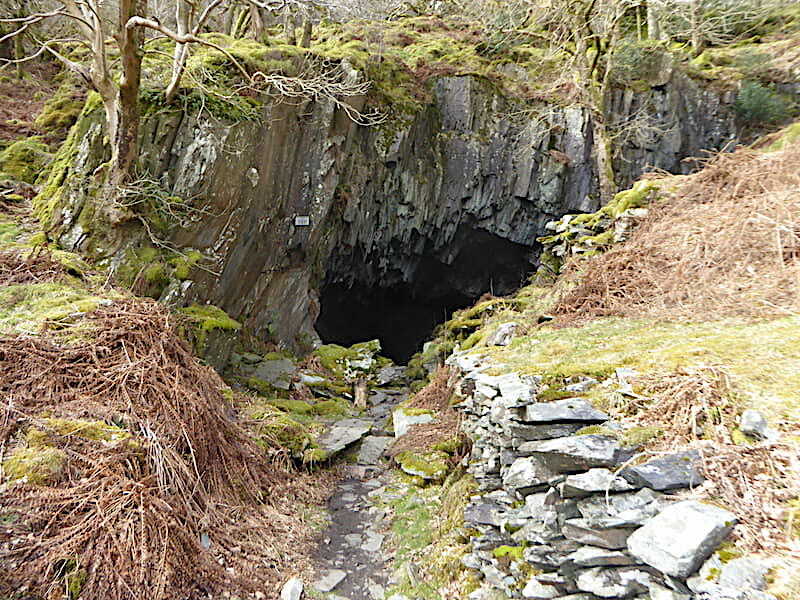 If you want to visit Millican Dalton’s cave then this un-named path is the one to take. 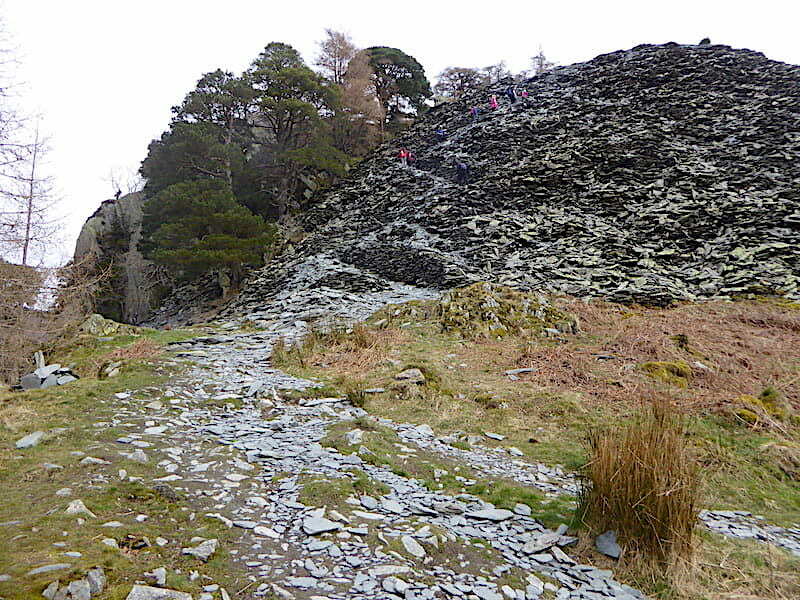 The path has a number of others leading from it, but it doesn’t really matter which one is taken, you just have to keep going upwards until you come to the disused quarry area. 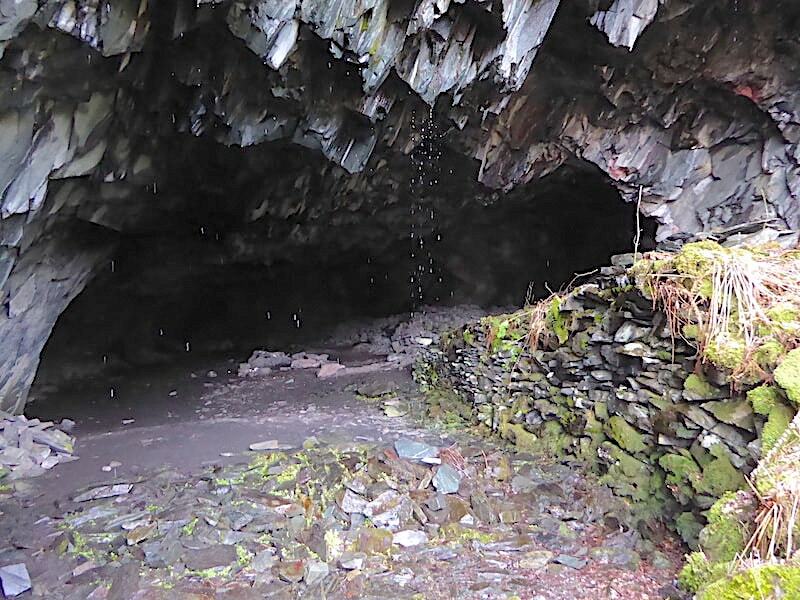 This is one of the caves in the area but the one used by Millican Dalton is just a little higher up so just keep going …..
….. until the entrance to the cave finally appears. 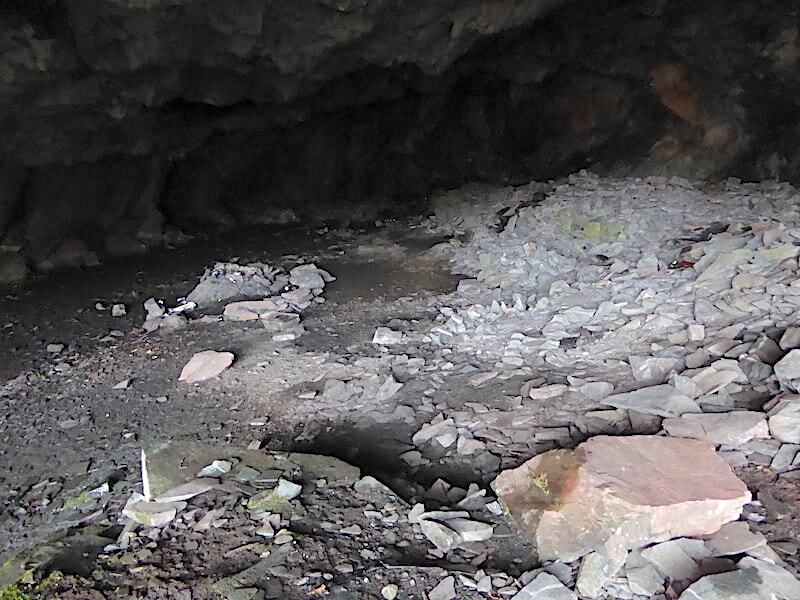 Water was constantly dripping across the entrance to Millican’s cave so we do a bit of droplet dodging and go in for a look around. 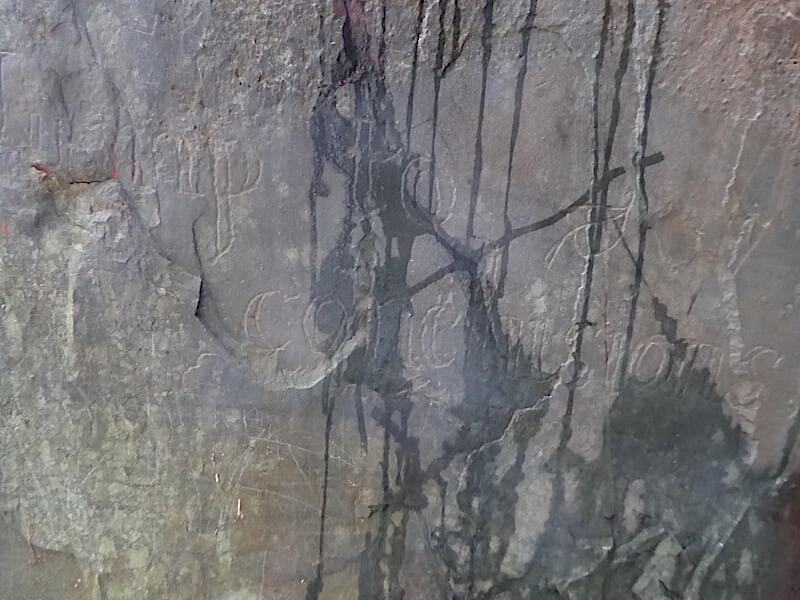 Millican Dalton was born in Nenthead, near Alston in Cumbria but grew up in the south of England when his family moved there following the death of his father. 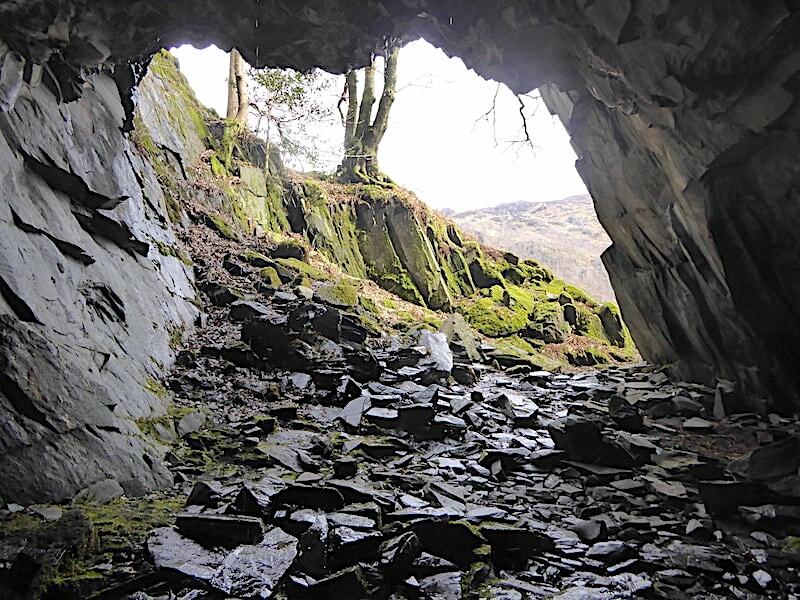 In his thirties he began living a simpler, more frugal life spending his winters in a woodland hut he had built in Buckinghamshire, and then living in this cave during the summer months. He styled himself the “Professor of Adventure’ and offered adventurous trips in the area to campers, climbers and general lovers of the outdoors. Neither a hermit or a recluse he enjoyed the company of like minded souls whilst also enjoying his relative solitude and simple life. 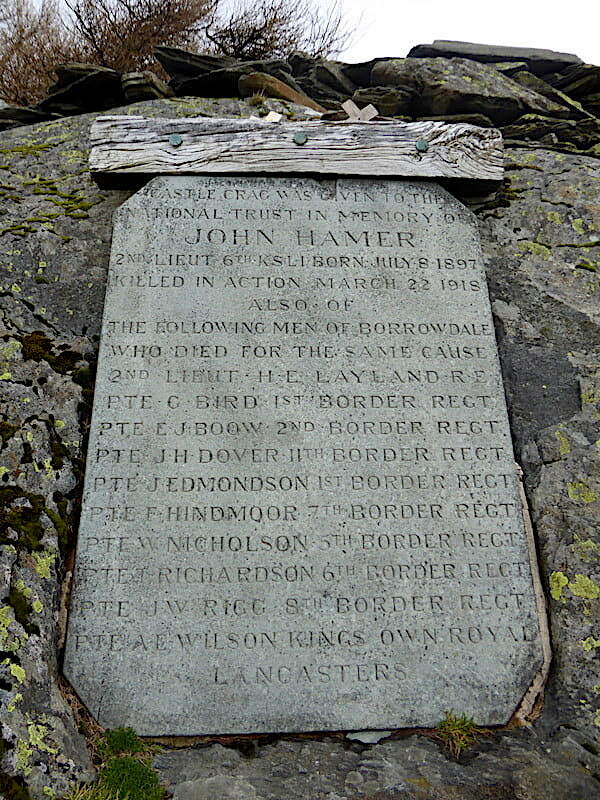 He died in Buckinghashire in 1947 aged seventy nine. 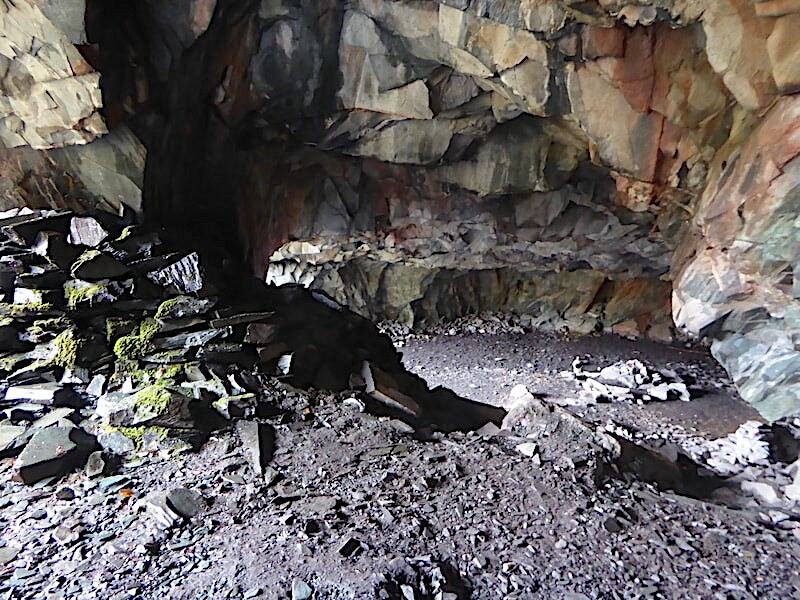 The cave is split level as can be seen from the daylight pouring in from an upper entrance. 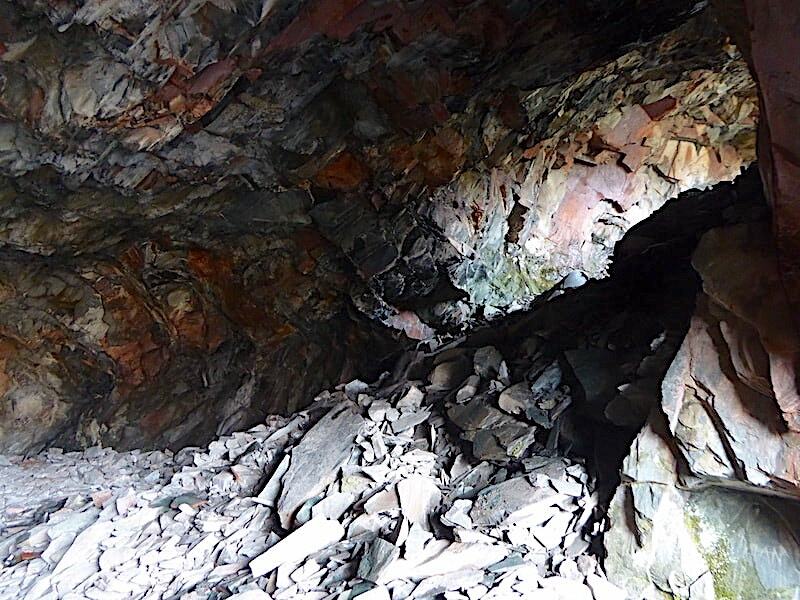 The rock walls of the cave are jewelled with some beautiful colours. From the upper level a look down to the lower one, it was a pity that the group who had had some sort of gathering down there at some time had left a large amount of litter strewn around. Surely if they could carry the party fare all the way up here it would be just as easy to take the now empty, and much lighter, wrappings and cans away with them. Do they think the bin lorry calls in here? The view back to the entrance of the upper level section of the cave where if you look hard enough you will find some of Millican Dalton’s handiwork etched into the rock face …..
Its difficult to photograph but it reads ‘DON’T WASTE WORDS …..
Millican’s front garden, or the view of King’s How and Brund Fell from the entrance to the upper level of the cave. 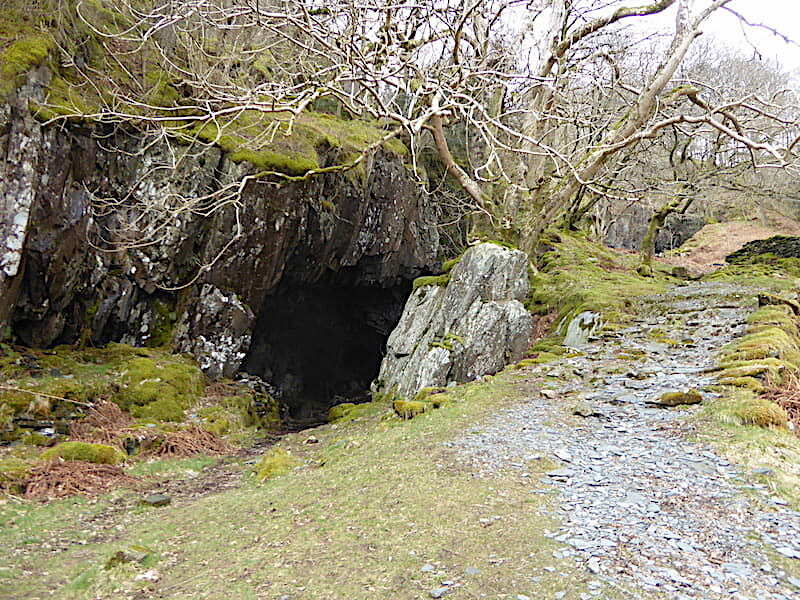 From the caves we rejoined the original path and had a pleasant stroll back through High Hows Wood …..
….. and, with a clear view of High Scawdel, continued along the path at Pennybridge Dub. New Bridge spanning the Derwent has some parts which are a little bit newer following the repairs to it after it was very badly damaged during Storm Desmond in 2016. 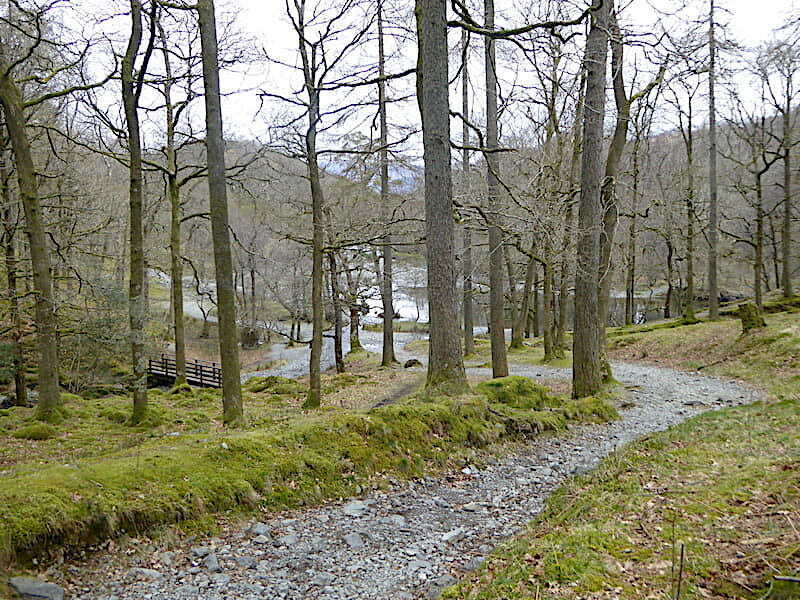 The path on the opposite side leads back to Rosthwaite so we keep to this side of the river. 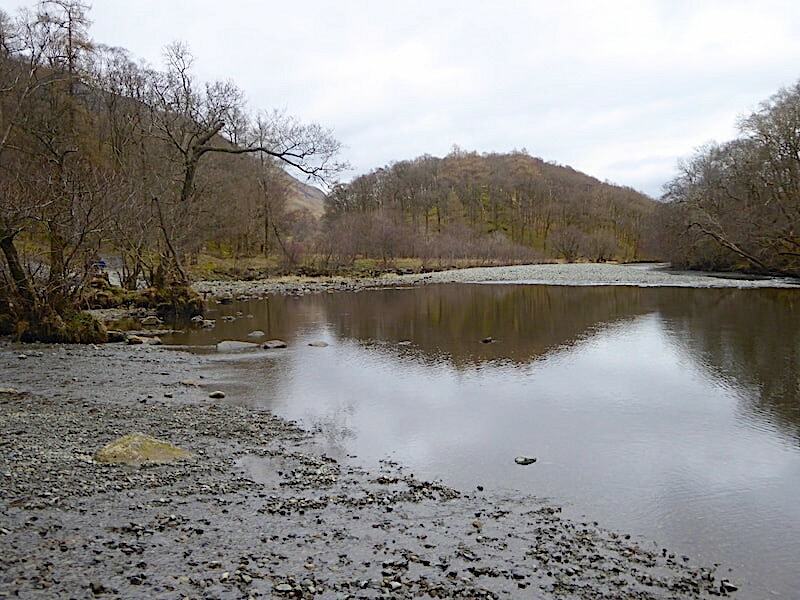 A look back to Low Scawdel from the bridge area before continuing our riverside walk. 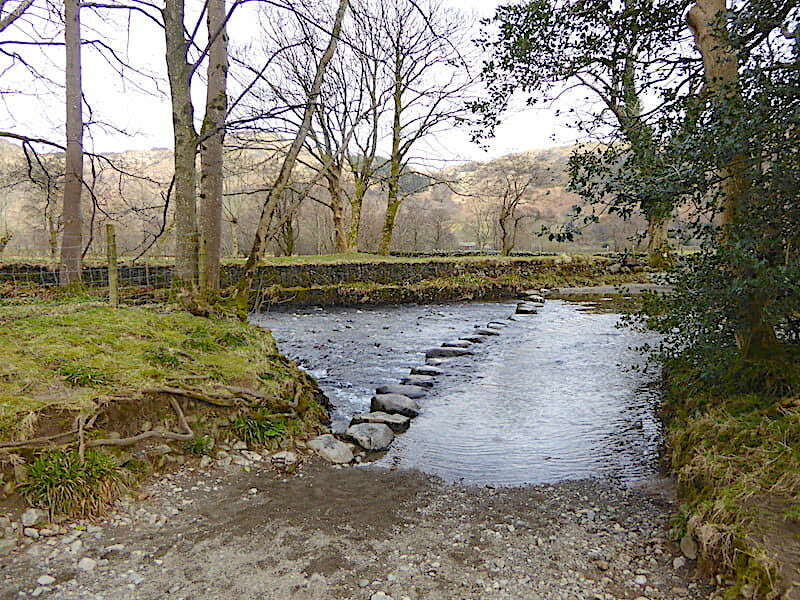 A little further along from the bridge crossing the river by way of these stepping stones will also lead you over to the path back to Rosthwaite. 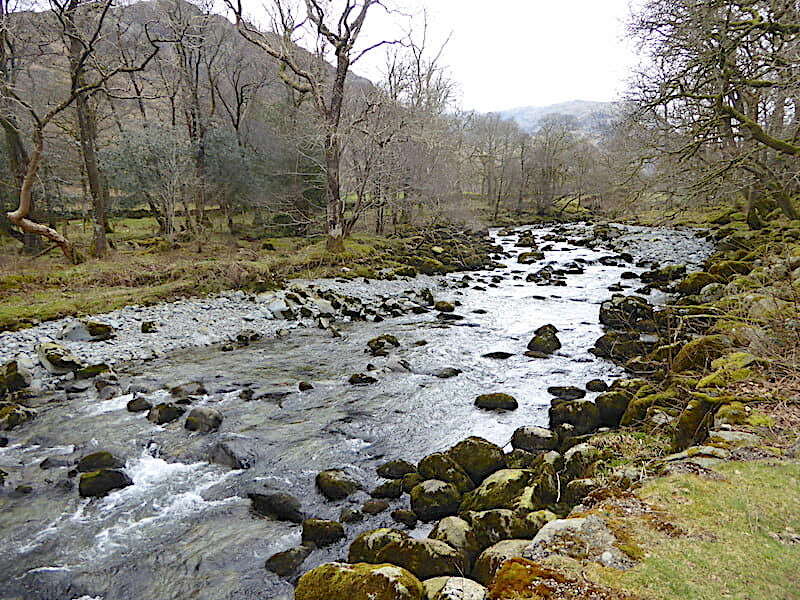 We keep to the same side of the river and make our way to Longthwaite where I took a look back at Low Scawdel and little Castle Crag beside it. 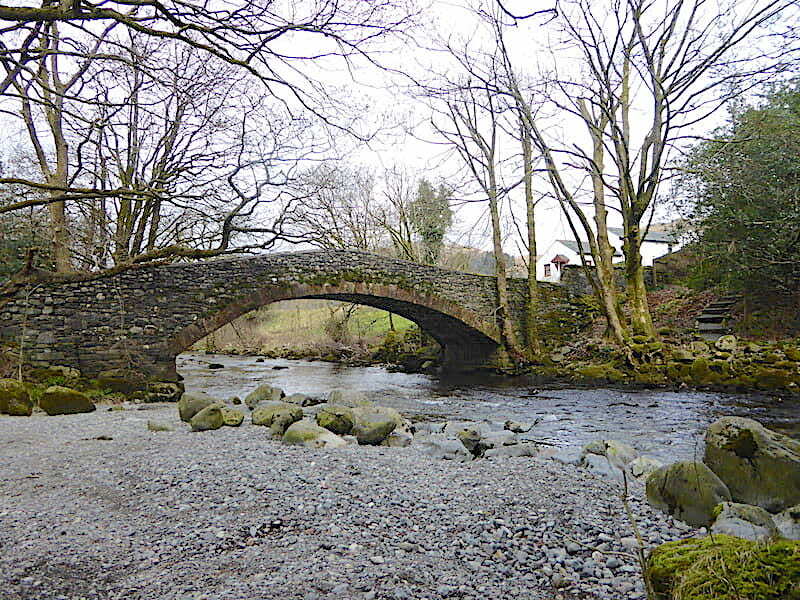 Another bridge crossing at Longthwaite, a peaceful place to perch yourself on one of the handy riverside boulders and quietly comtemplate whatever you feel like contemplating. Well it was peaceful until a big tractor arrived to pick up a plastic wrapped bundle of silage to deliver to the ewes and lambs in the fields just up the road. From the bridge there’s another pleasant and relaxing walk alongside the river at the base of Johnny Wood on the way back to Seatoller. It doesn’t remain so flat and serene all the way back though and as we reach a bend in the river …..
….. a short rocky section provides a few seconds of adventure with a handy chain by way of a handhold …..
….. which is quickly followed by a steep, sharp drop down to regain the path back to Seatoller. The remainder of the walk back holds no hidden surprises and we have an uneventful stroll back. Glaramara and Base Brown are clear now but the cloud layer is still obscuring the views beyond them. Across to our left are Folly Bridge and Mountain View Cottages with the gnarled and knobbly Bessyboot beyond them. 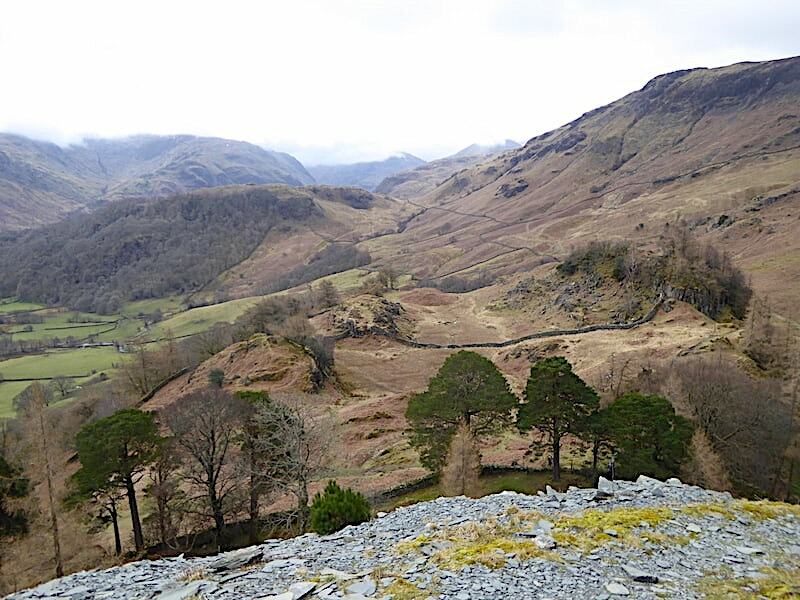 Straight in front of us is Glaramara and to the left of it we can finally see the pointy top of Rosthwaite Cam. 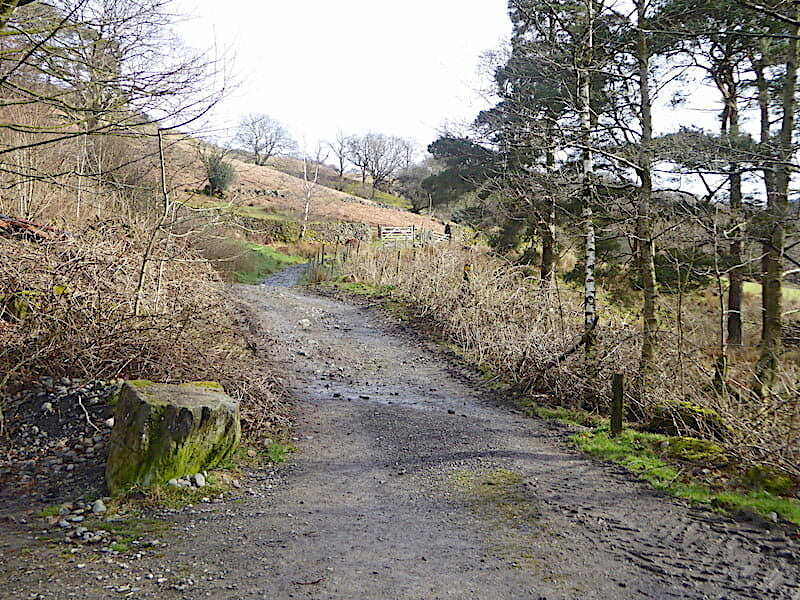 We go through the gate and walk down the short track back to the Seatoller car park where the double decker bus has just turned around to begin its journey back to Keswick. 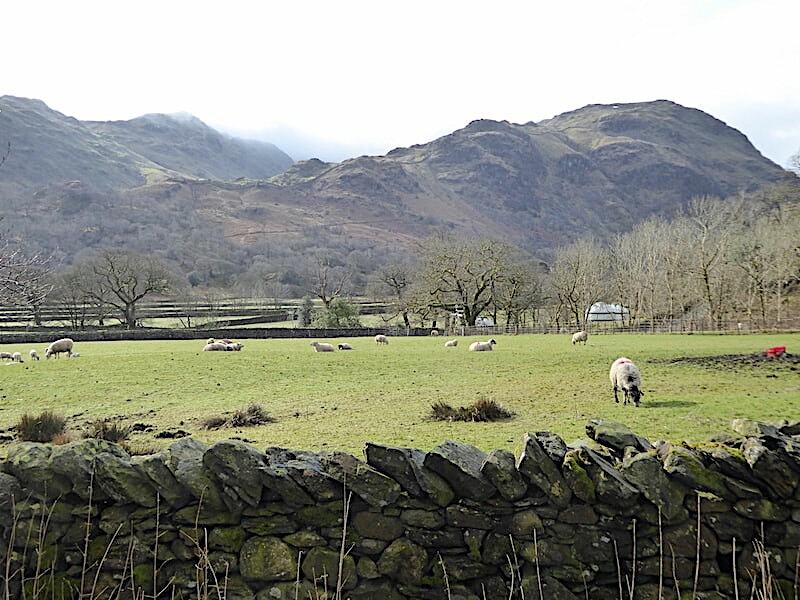 This bus service offers a regular timetable between Keswick and Seatoller from March to October so its possible to enjoy Borrowdale and its surrounding fells during these months without enduring the nightmare of finding somewhere to park in this very popular area. So we come to the end of our very enjoyable and leisurely walk. 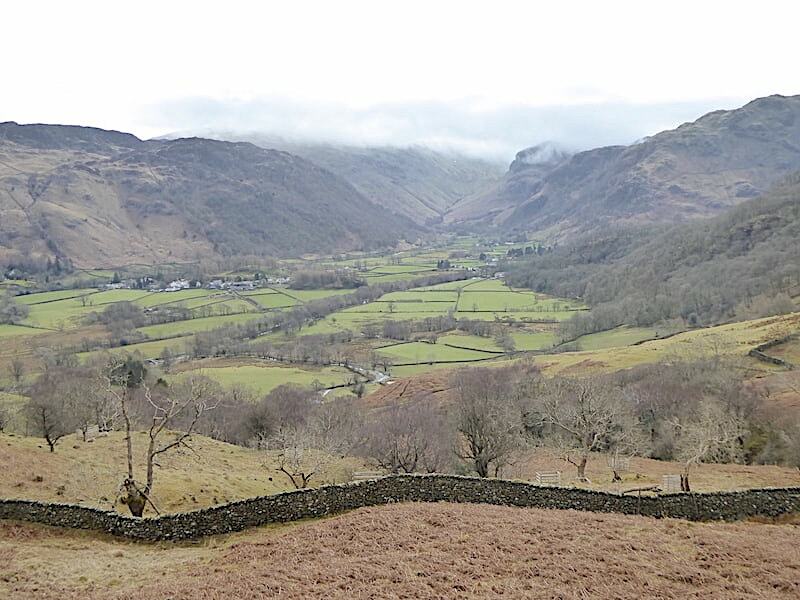 Despite the low cloud the weather remained dry and mild and, for almost the whole of the walk, our jackets remained in our packs, even some tiny green leaves were beginning to sprout on the hawthorn bushes around the edge of the car park. Dare we believe that winter has finally loosened its grip?